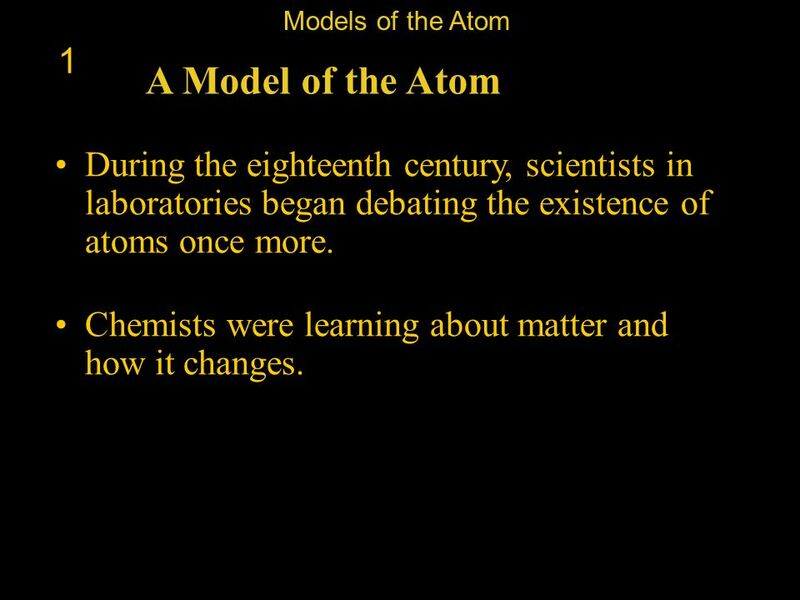 2 Models of the Atom 1 First Thoughts People began wondering about matter more than 2,500 years ago. Some of the early philosophers thought that matter was composed of tiny particles. They reasoned that you could take a piece of matter, cut it in half, cut the half piece in half again, and continue to cut again and again. 3 First Thoughts 1 Eventually, you wouldn’t be able to cut any more. 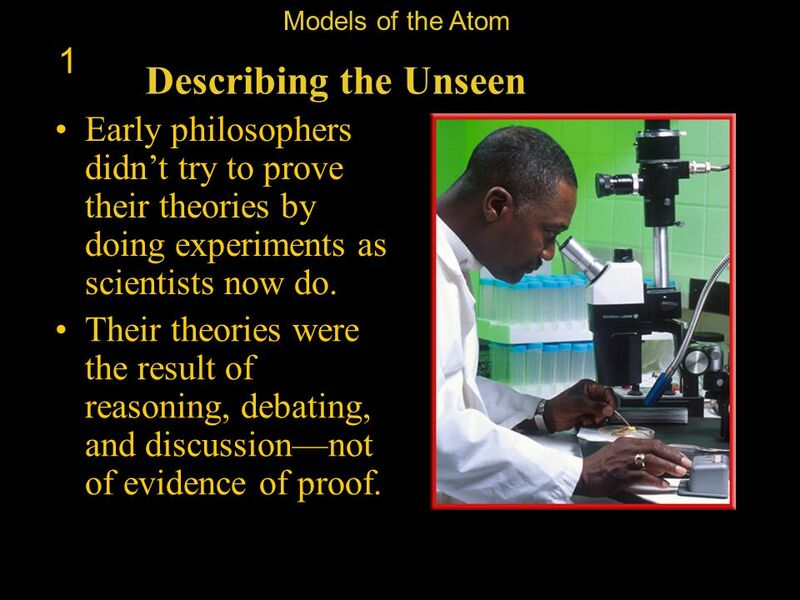 4 Models of the Atom 1 Describing the Unseen Early philosophers didn’t try to prove their theories by doing experiments as scientists now do. Their theories were the result of reasoning, debating, and discussion—not of evidence of proof. 5 Models of the Atom 1 A Model of the Atom During the eighteenth century, scientists in laboratories began debating the existence of atoms once more. Chemists were learning about matter and how it changes. 6 Models of the Atom 1 A Model of the Atom They found that certain substances couldn’t be broken down into simpler substances. Scientists came to realize that all matter is made up of elements. An element is matter made of atoms of only one kind. 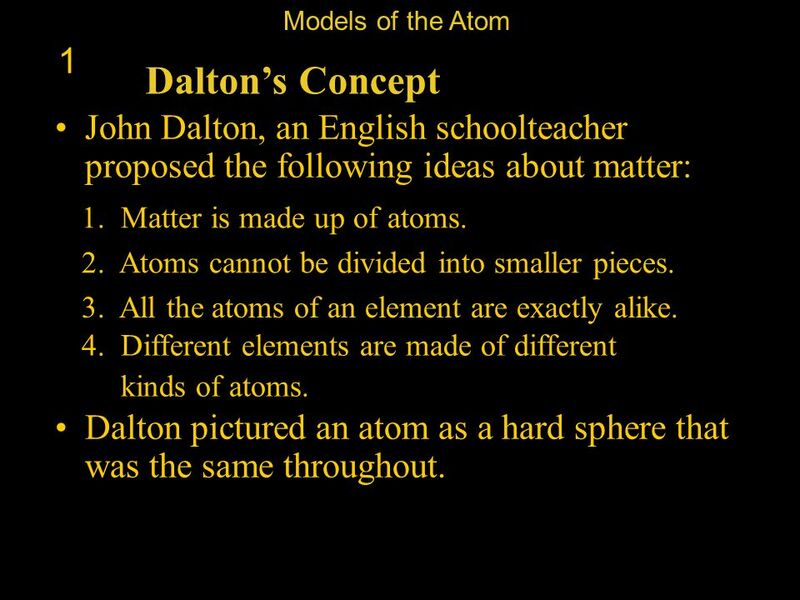 7 Models of the Atom 1 Dalton’s Concept John Dalton, an English schoolteacher proposed the following ideas about matter: 1. Matter is made up of atoms. 2. Atoms cannot be divided into smaller pieces. 3. All the atoms of an element are exactly alike. 4. 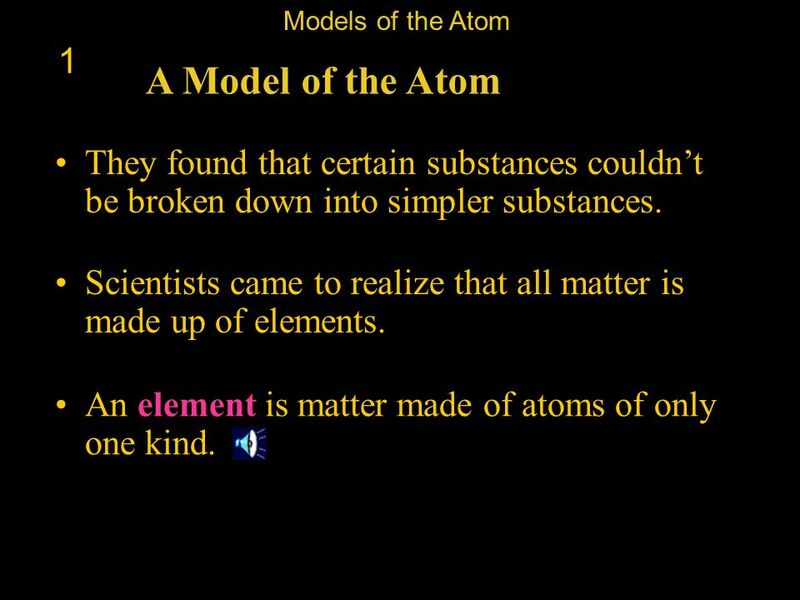 Different elements are made of different kinds of atoms. Dalton pictured an atom as a hard sphere that was the same throughout. 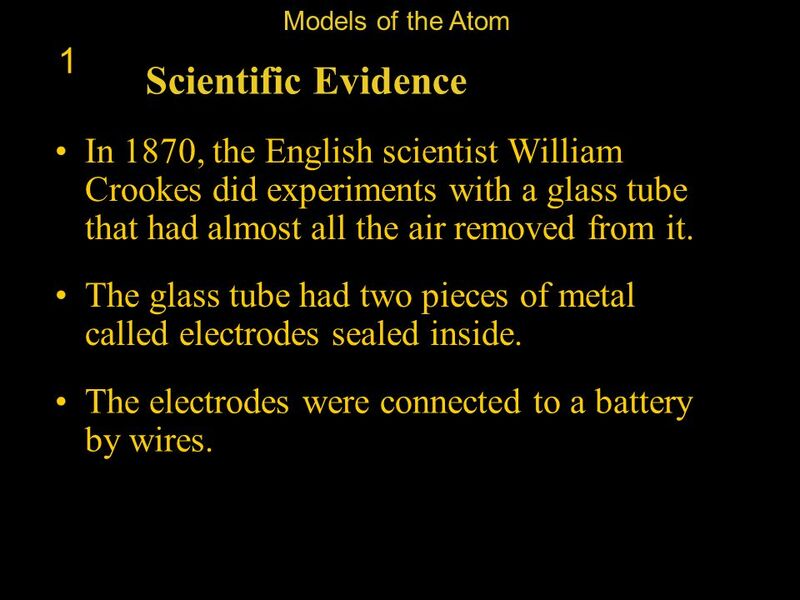 8 Models of the Atom 1 Scientific Evidence In 1870, the English scientist William Crookes did experiments with a glass tube that had almost all the air removed from it. The glass tube had two pieces of metal called electrodes sealed inside. The electrodes were connected to a battery by wires. 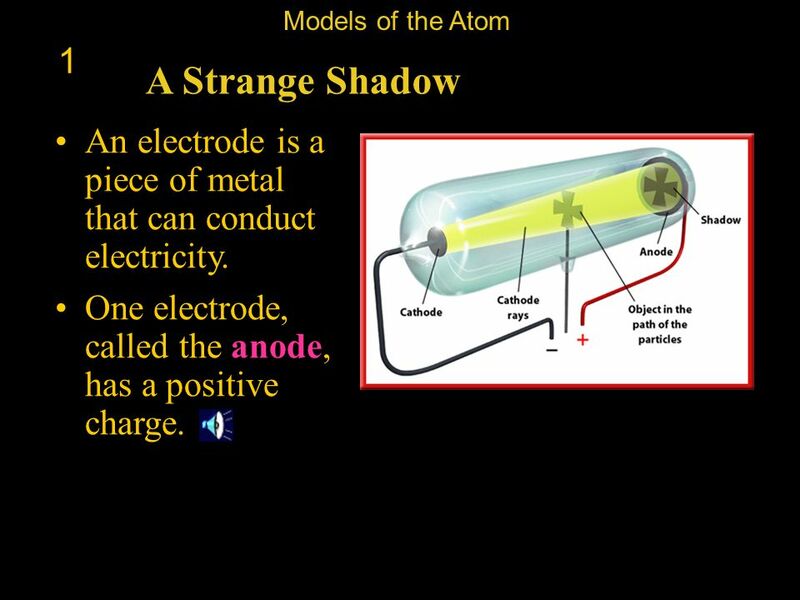 9 Models of the Atom 1 A Strange Shadow An electrode is a piece of metal that can conduct electricity. One electrode, called the anode, has a positive charge. 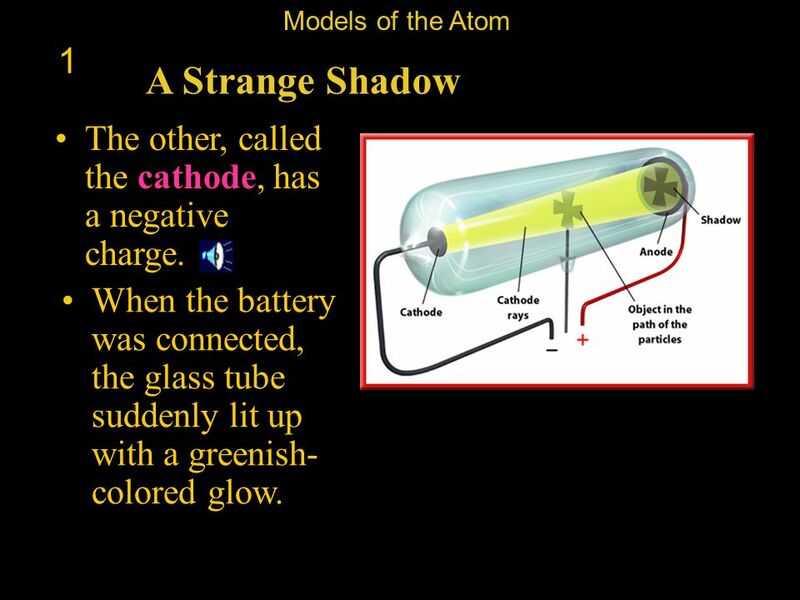 10 Models of the Atom 1 A Strange Shadow The other, called the cathode, has a negative charge. When the battery was connected, the glass tube suddenly lit up with a greenish-colored glow. 11 Models of the Atom 1 A Strange Shadow A shadow of the object appeared at the opposite end of the tube—the anode. 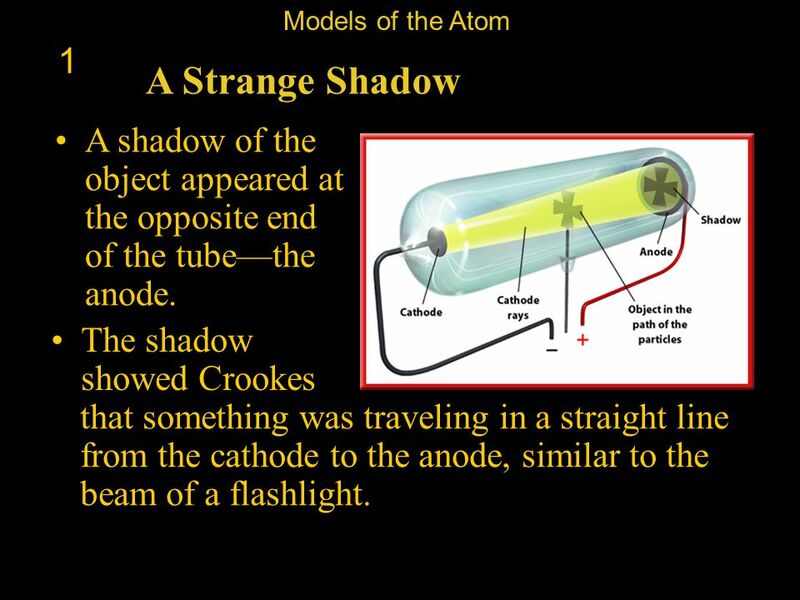 The shadow showed Crookes that something was traveling in a straight line from the cathode to the anode, similar to the beam of a flashlight. 12 Models of the Atom 1 A Strange Shadow The cross-shaped object was getting in the way of the beam and blocking it. 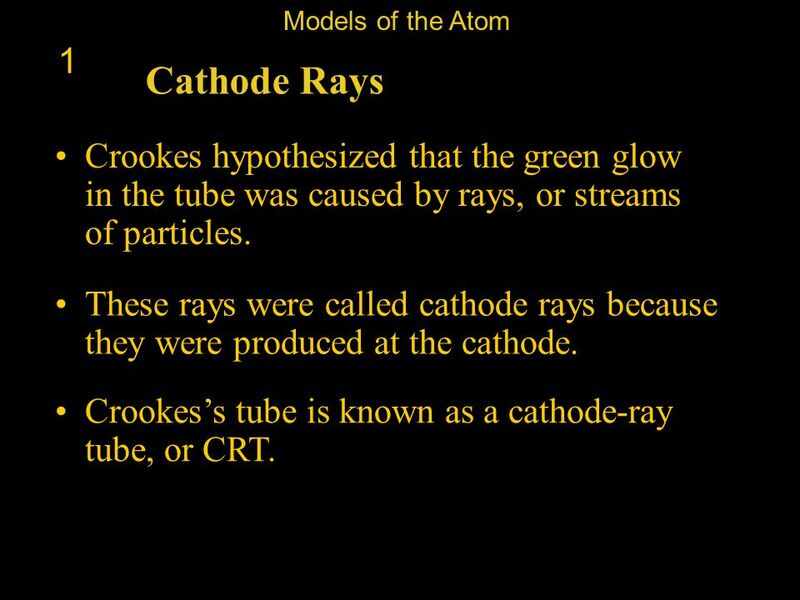 13 Models of the Atom 1 Cathode Rays Crookes hypothesized that the green glow in the tube was caused by rays, or streams of particles. These rays were called cathode rays because they were produced at the cathode. Crookes’s tube is known as a cathode-ray tube, or CRT. 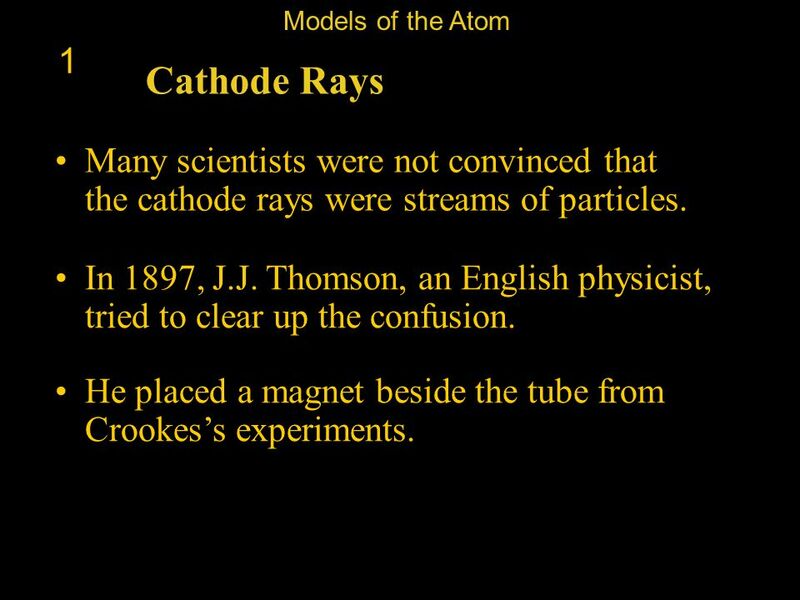 14 Models of the Atom 1 Cathode Rays Many scientists were not convinced that the cathode rays were streams of particles. In 1897, J.J. Thomson, an English physicist, tried to clear up the confusion. He placed a magnet beside the tube from Crookes’s experiments. 15 Cathode Rays 1 The beam is bent in the direction of the magnet. Models of the Atom 1 Cathode Rays The beam is bent in the direction of the magnet. Light cannot be bent by a magnet, so the beam couldn’t be light. 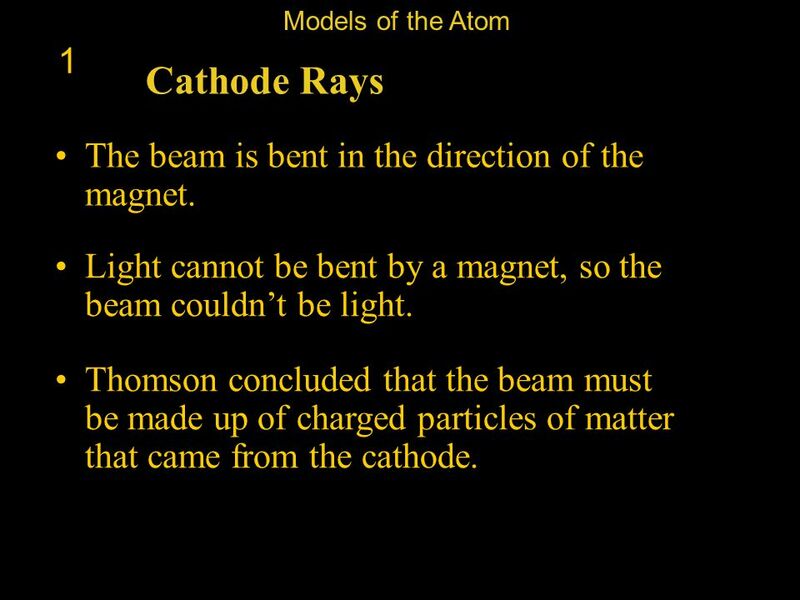 Thomson concluded that the beam must be made up of charged particles of matter that came from the cathode. 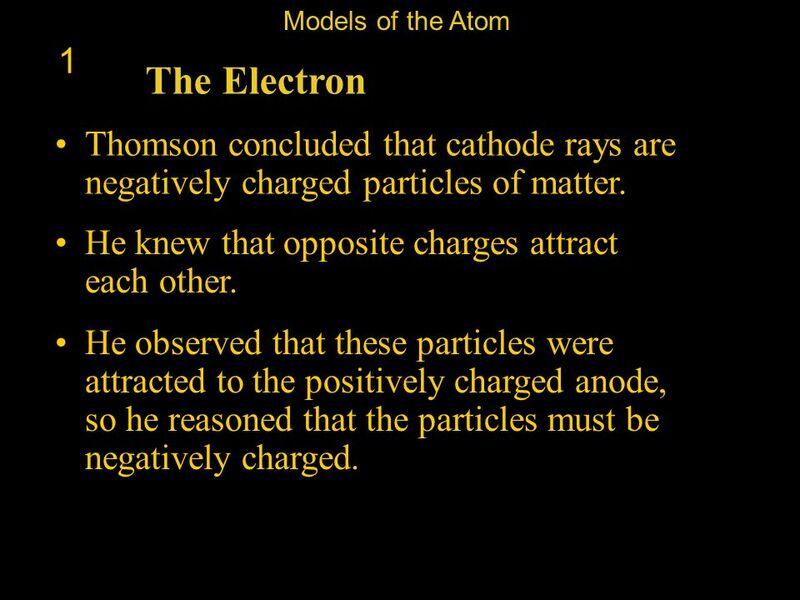 16 Models of the Atom 1 The Electron Thomson concluded that cathode rays are negatively charged particles of matter. He knew that opposite charges attract each other. He observed that these particles were attracted to the positively charged anode, so he reasoned that the particles must be negatively charged. 17 Models of the Atom 1 The Electron These negatively charged particles are now called electrons. 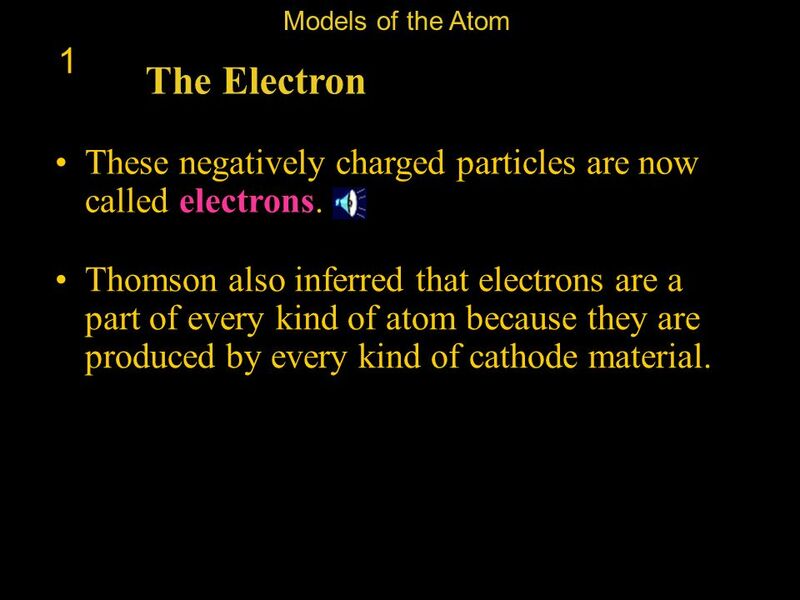 Thomson also inferred that electrons are a part of every kind of atom because they are produced by every kind of cathode material. 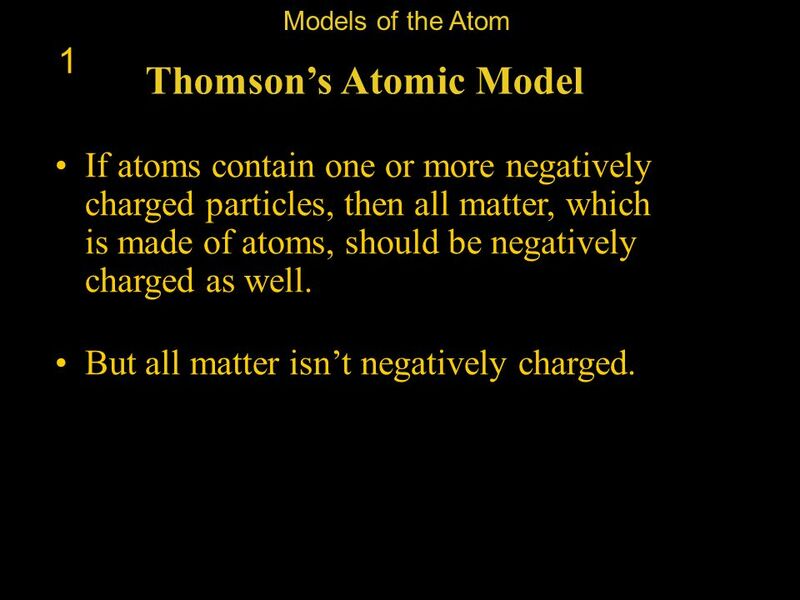 Models of the Atom 1 Thomson’s Atomic Model If atoms contain one or more negatively charged particles, then all matter, which is made of atoms, should be negatively charged as well. But all matter isn’t negatively charged. 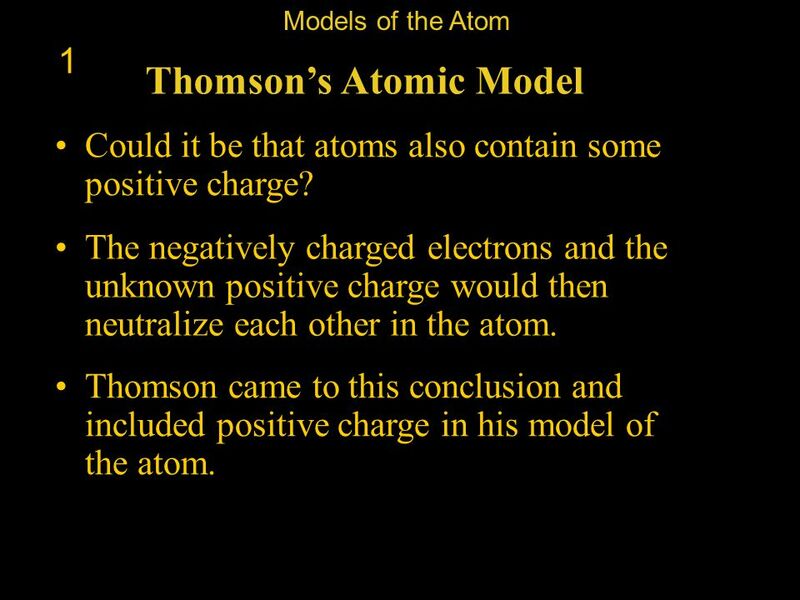 Models of the Atom 1 Thomson’s Atomic Model Could it be that atoms also contain some positive charge? The negatively charged electrons and the unknown positive charge would then neutralize each other in the atom. 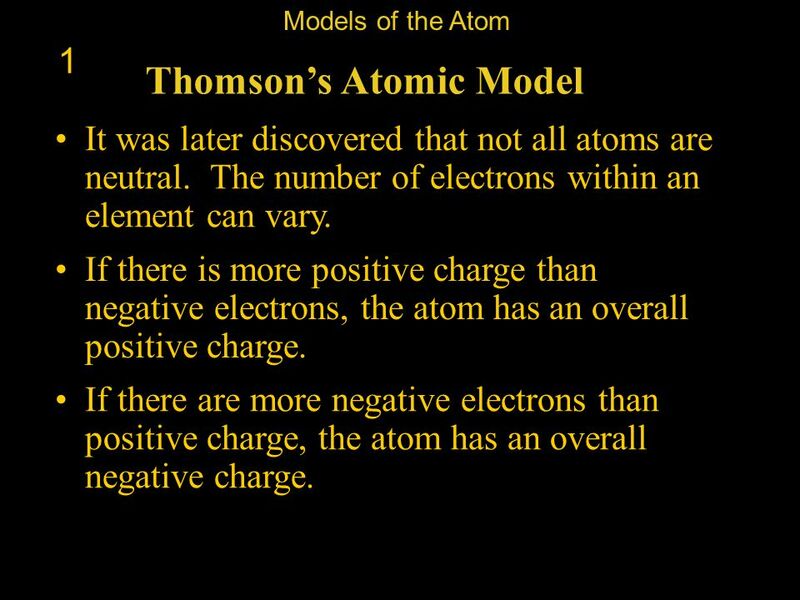 Thomson came to this conclusion and included positive charge in his model of the atom. Models of the Atom 1 Thomson’s Atomic Model Thomson pictured a sphere of positive charge. The negatively charged electrons were spread evenly among the positive charge. The atom is neutral. 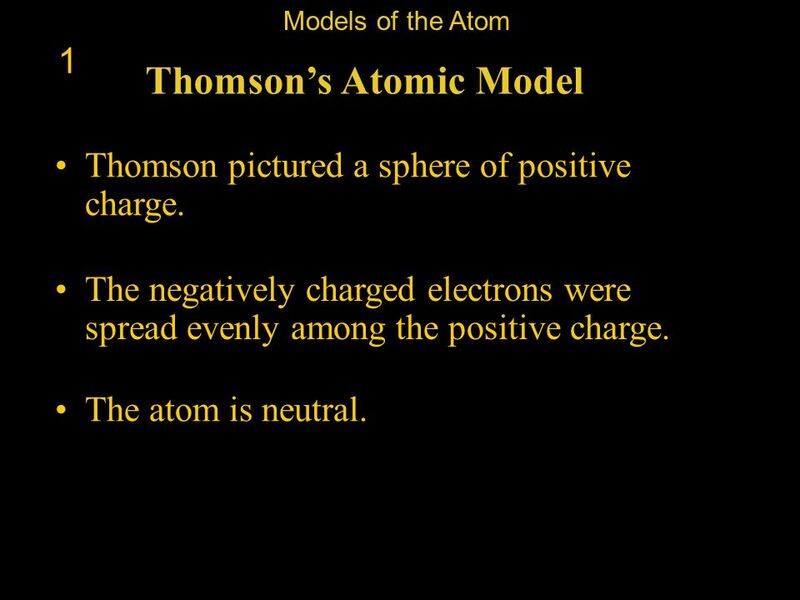 Models of the Atom 1 Thomson’s Atomic Model It was later discovered that not all atoms are neutral. The number of electrons within an element can vary. If there is more positive charge than negative electrons, the atom has an overall positive charge. If there are more negative electrons than positive charge, the atom has an overall negative charge. 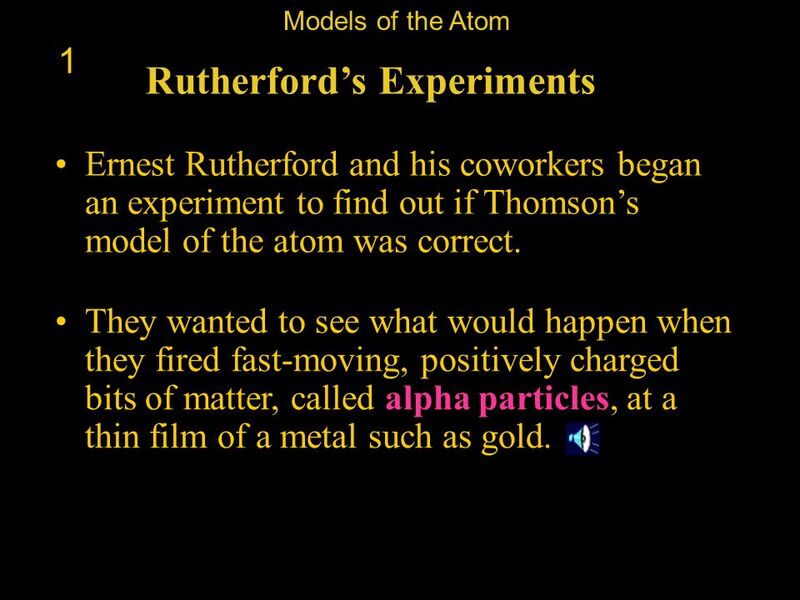 Models of the Atom 1 Rutherford’s Experiments Ernest Rutherford and his coworkers began an experiment to find out if Thomson’s model of the atom was correct. They wanted to see what would happen when they fired fast-moving, positively charged bits of matter, called alpha particles, at a thin film of a metal such as gold. 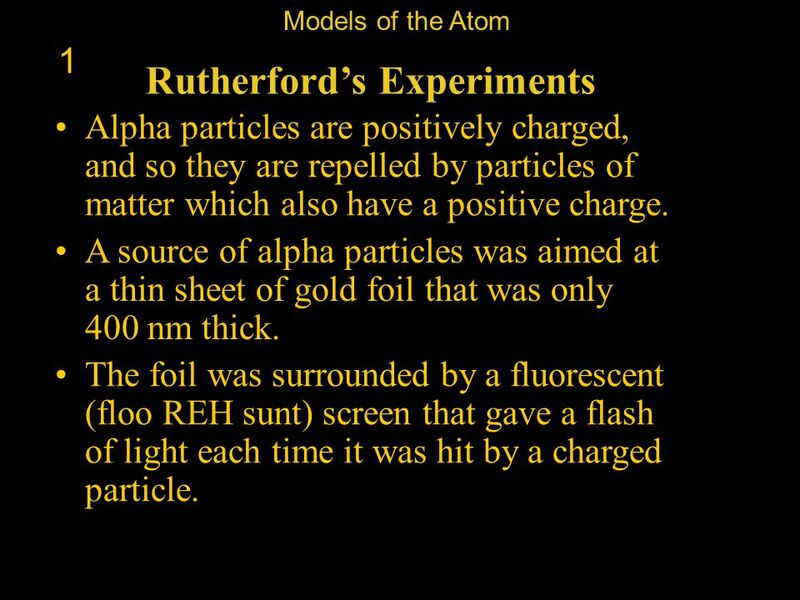 Models of the Atom 1 Rutherford’s Experiments Alpha particles are positively charged, and so they are repelled by particles of matter which also have a positive charge. A source of alpha particles was aimed at a thin sheet of gold foil that was only 400 nm thick. The foil was surrounded by a fluorescent (floo REH sunt) screen that gave a flash of light each time it was hit by a charged particle. 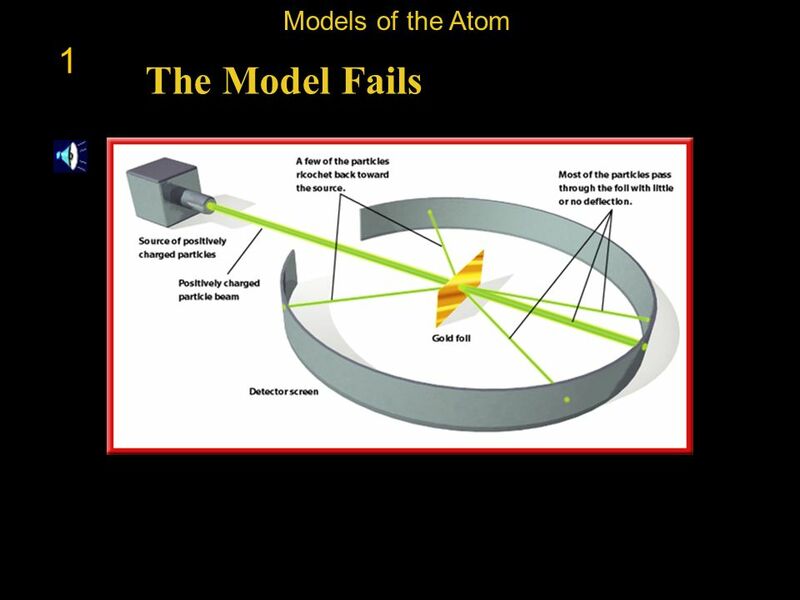 24 Models of the Atom 1 Expected Results His prediction was that most of the speeding alpha particles would pass right through the foil and hit the screen on the other side. 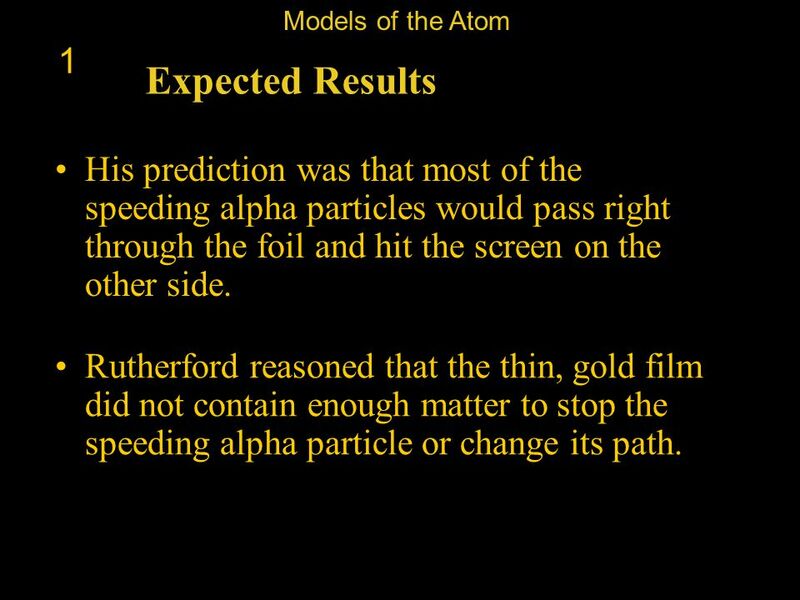 Rutherford reasoned that the thin, gold film did not contain enough matter to stop the speeding alpha particle or change its path. 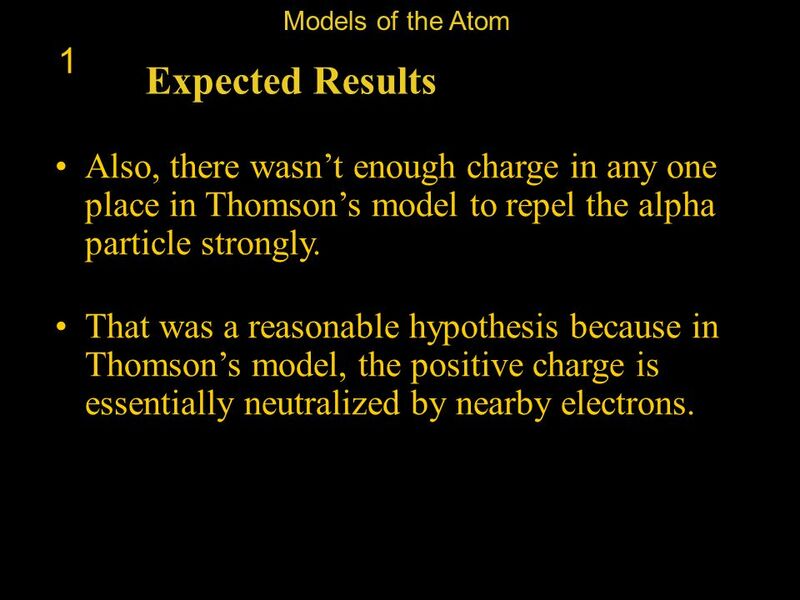 25 Models of the Atom 1 Expected Results Also, there wasn’t enough charge in any one place in Thomson’s model to repel the alpha particle strongly. That was a reasonable hypothesis because in Thomson’s model, the positive charge is essentially neutralized by nearby electrons. 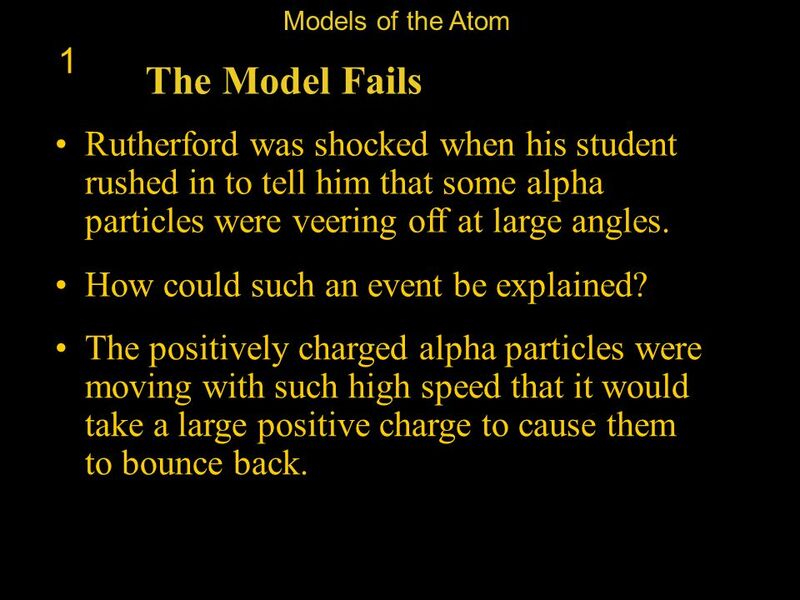 26 Models of the Atom 1 The Model Fails Rutherford was shocked when his student rushed in to tell him that some alpha particles were veering off at large angles. How could such an event be explained? The positively charged alpha particles were moving with such high speed that it would take a large positive charge to cause them to bounce back. 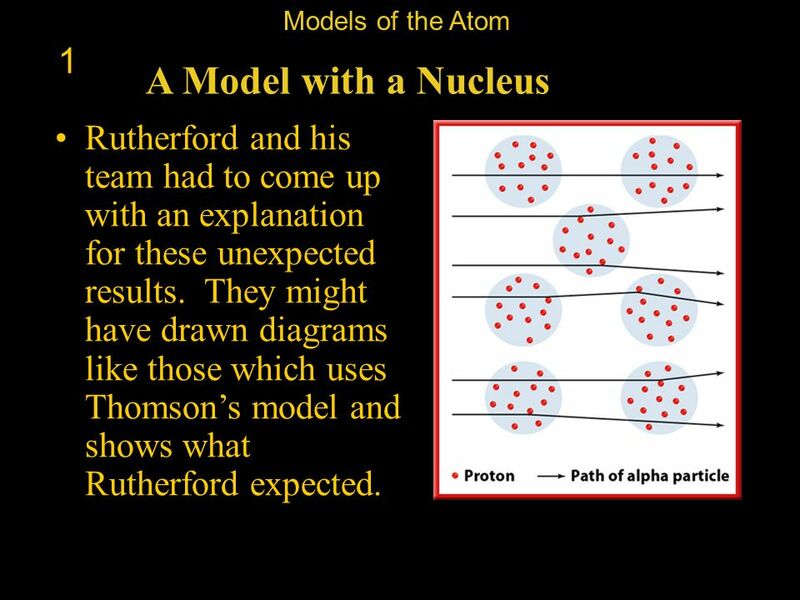 28 Models of the Atom 1 A Model with a Nucleus Rutherford and his team had to come up with an explanation for these unexpected results. They might have drawn diagrams like those which uses Thomson’s model and shows what Rutherford expected. 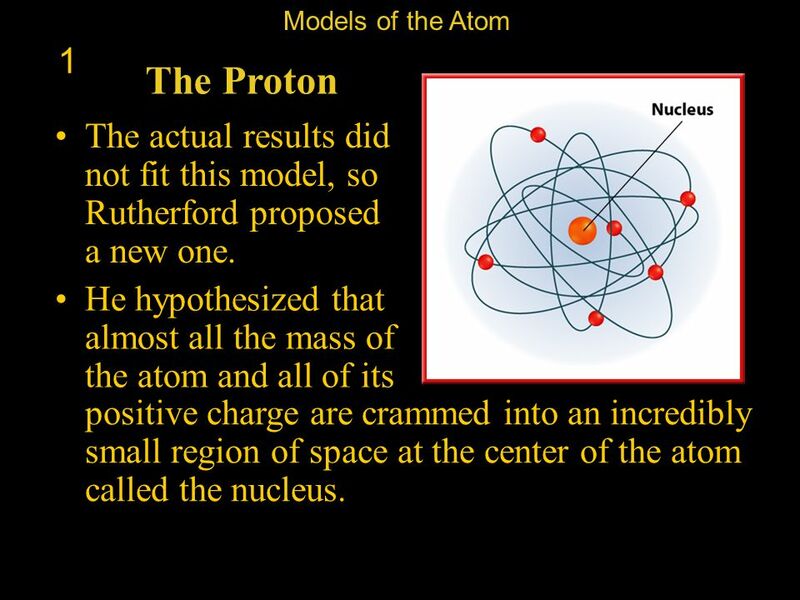 29 Models of the Atom 1 The Proton The actual results did not fit this model, so Rutherford proposed a new one. He hypothesized that almost all the mass of the atom and all of its positive charge are crammed into an incredibly small region of space at the center of the atom called the nucleus. 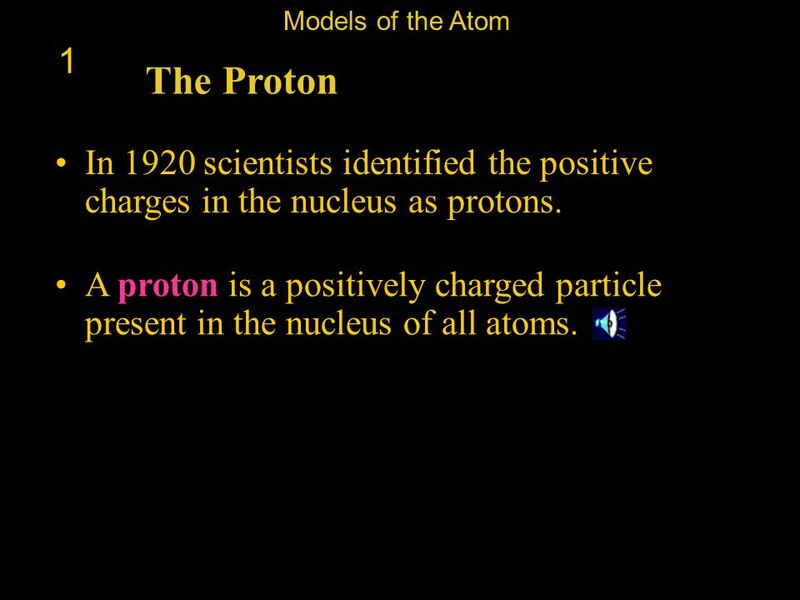 30 Models of the Atom 1 The Proton In 1920 scientists identified the positive charges in the nucleus as protons. A proton is a positively charged particle present in the nucleus of all atoms. 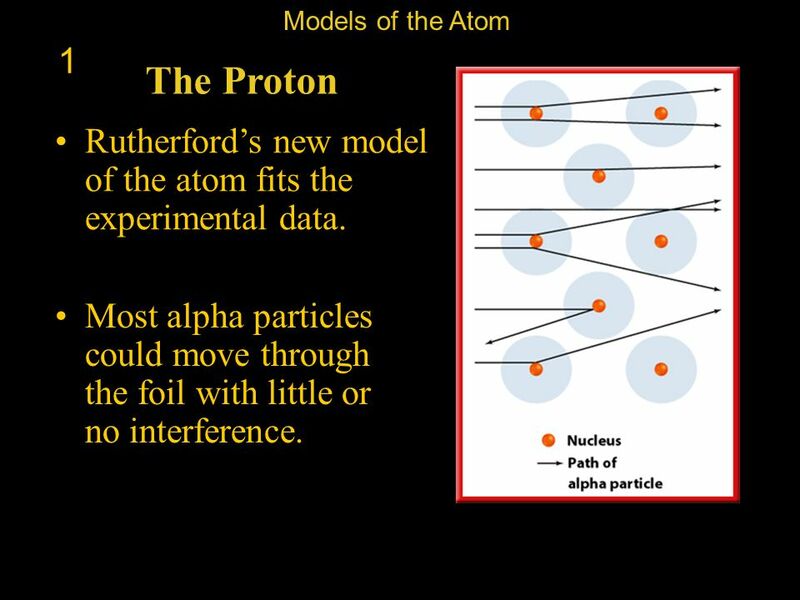 31 Models of the Atom 1 The Proton Rutherford’s new model of the atom fits the experimental data. Most alpha particles could move through the foil with little or no interference. 32 Models of the Atom 1 The Proton However, if an alpha particle made a direct hit on the nucleus of a gold atom, which has 70 protons, the alpha particle would be strongly repelled and bounce back. 33 The Neutron 1 An atom’s electrons have almost no mass. 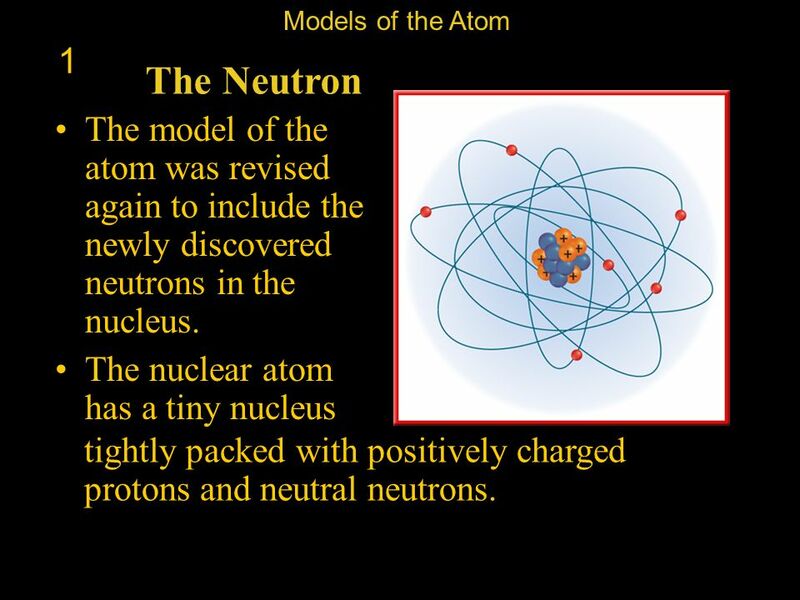 Models of the Atom 1 The Neutron An atom’s electrons have almost no mass. 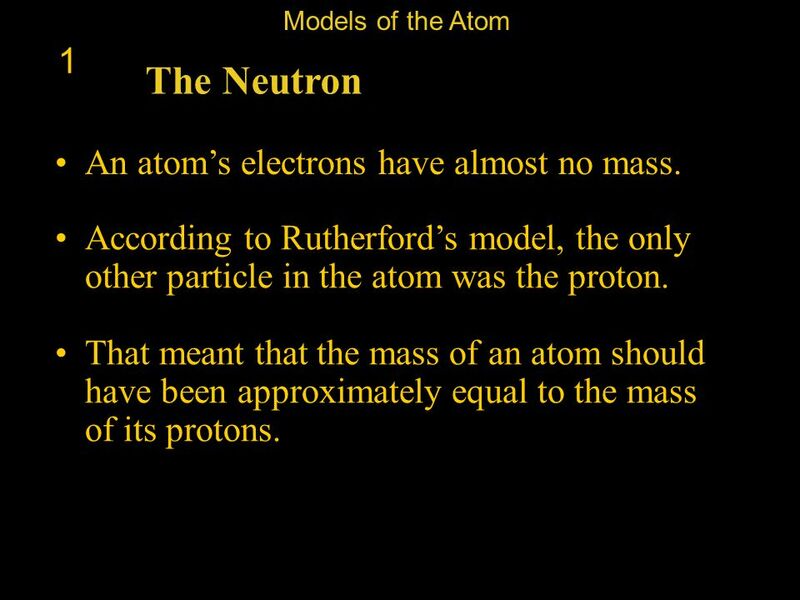 According to Rutherford’s model, the only other particle in the atom was the proton. That meant that the mass of an atom should have been approximately equal to the mass of its protons. 34 The Neutron 1 However, it wasn’t. Models of the Atom 1 The Neutron However, it wasn’t. The mass of most atoms is at least twice as great as the mass of its protons. It was proposed that another particle must be in the nucleus to account for the extra mass. 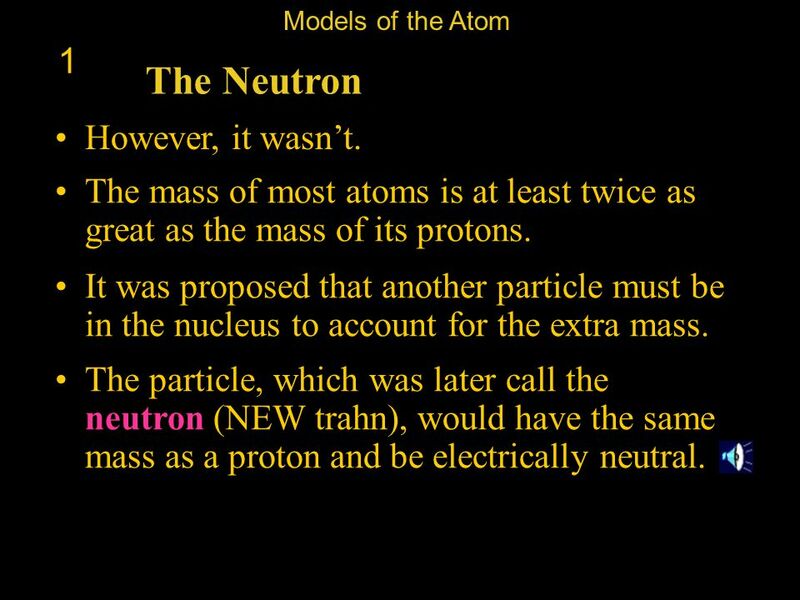 The particle, which was later call the neutron (NEW trahn), would have the same mass as a proton and be electrically neutral. 35 Models of the Atom 1 The Neutron Proving the existence of neutrons was difficult though, because a neutron has no charge. It took another 20 years before scientists were able to show by more modern experiments that atoms contain neutrons. 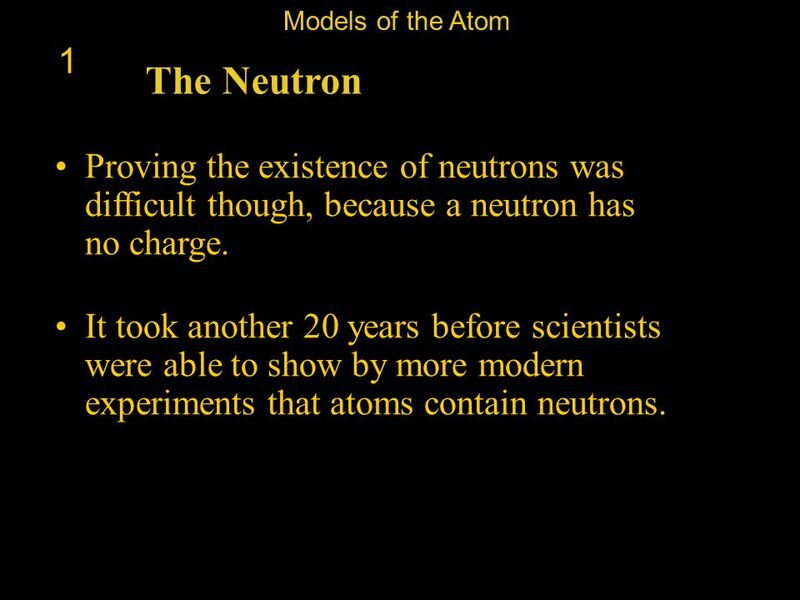 36 Models of the Atom 1 The Neutron The model of the atom was revised again to include the newly discovered neutrons in the nucleus. The nuclear atom has a tiny nucleus tightly packed with positively charged protons and neutral neutrons. 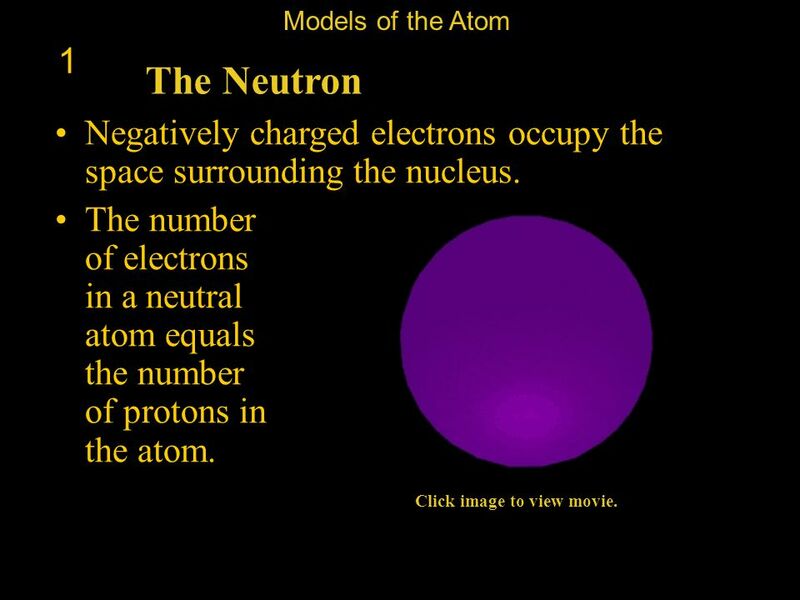 37 Models of the Atom 1 The Neutron Negatively charged electrons occupy the space surrounding the nucleus. The number of electrons in a neutral atom equals the number of protons in the atom. Click image to view movie. 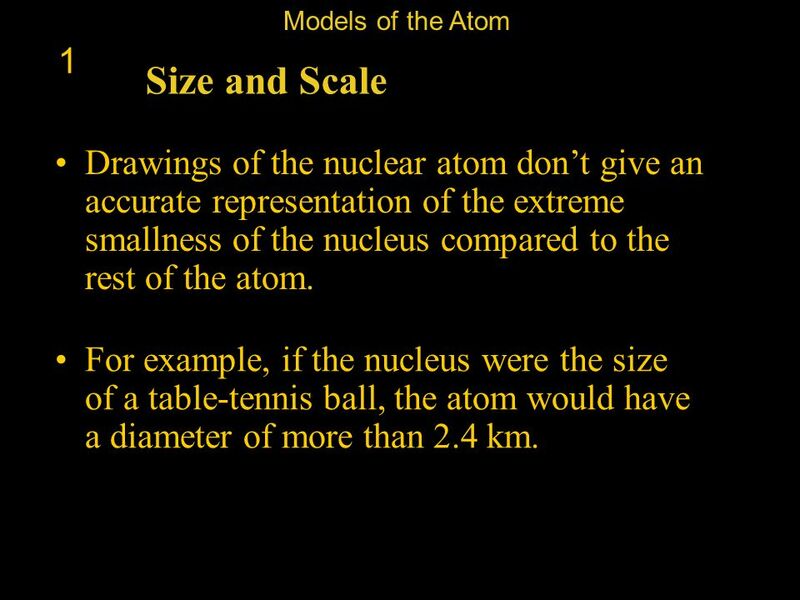 38 Models of the Atom 1 Size and Scale Drawings of the nuclear atom don’t give an accurate representation of the extreme smallness of the nucleus compared to the rest of the atom. For example, if the nucleus were the size of a table-tennis ball, the atom would have a diameter of more than 2.4 km. 39 Models of the Atom 1 Further Developments Even into the twentieth century, physicists were working on a theory to explain how electrons are arranged in an atom. 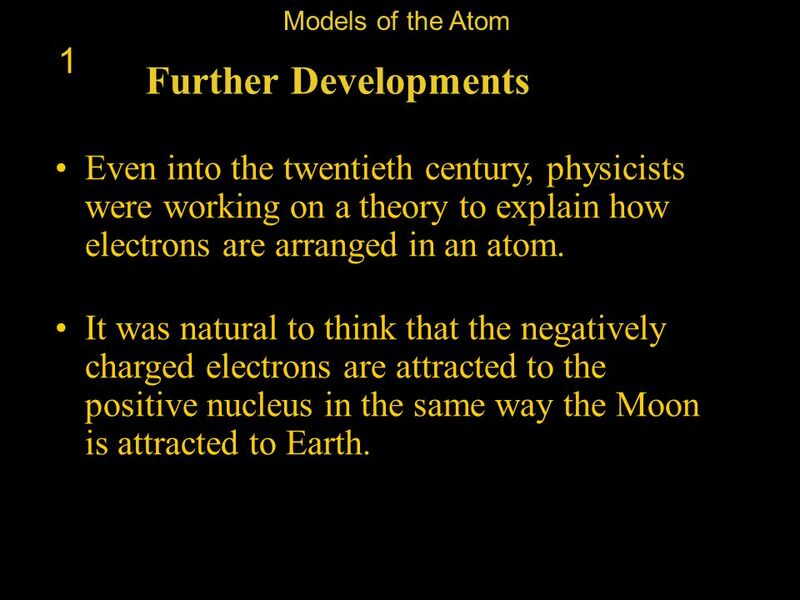 It was natural to think that the negatively charged electrons are attracted to the positive nucleus in the same way the Moon is attracted to Earth. 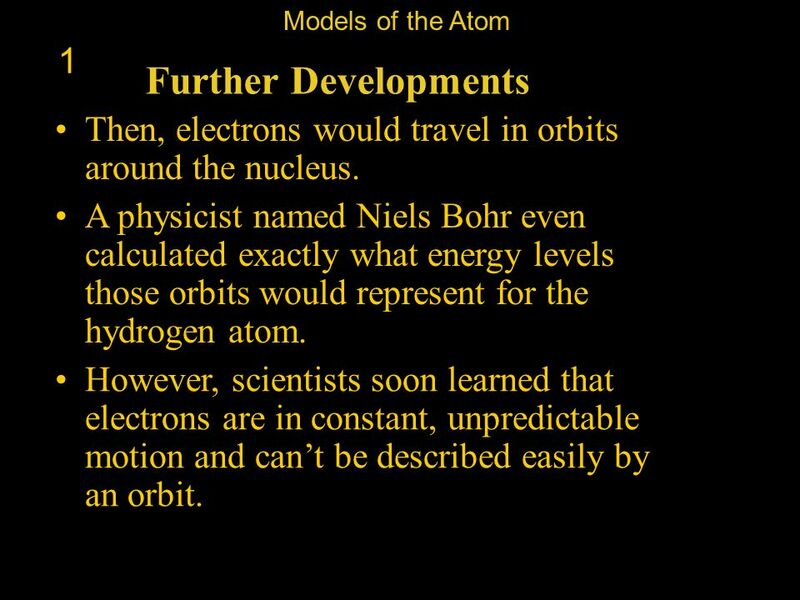 40 Models of the Atom 1 Further Developments Then, electrons would travel in orbits around the nucleus. A physicist named Niels Bohr even calculated exactly what energy levels those orbits would represent for the hydrogen atom. However, scientists soon learned that electrons are in constant, unpredictable motion and can’t be described easily by an orbit. 41 Models of the Atom 1 Electrons as Waves Physicists began to wrestle with explaining the unpredictable nature of electrons. 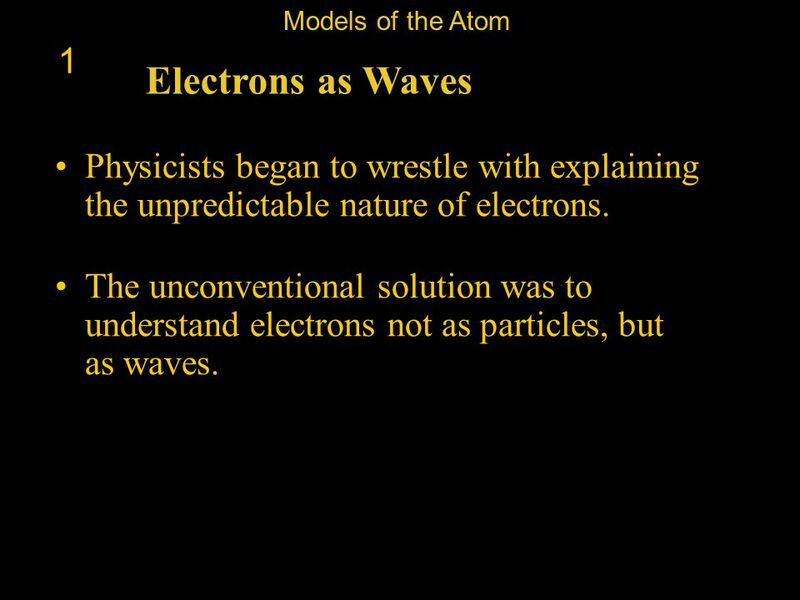 The unconventional solution was to understand electrons not as particles, but as waves. 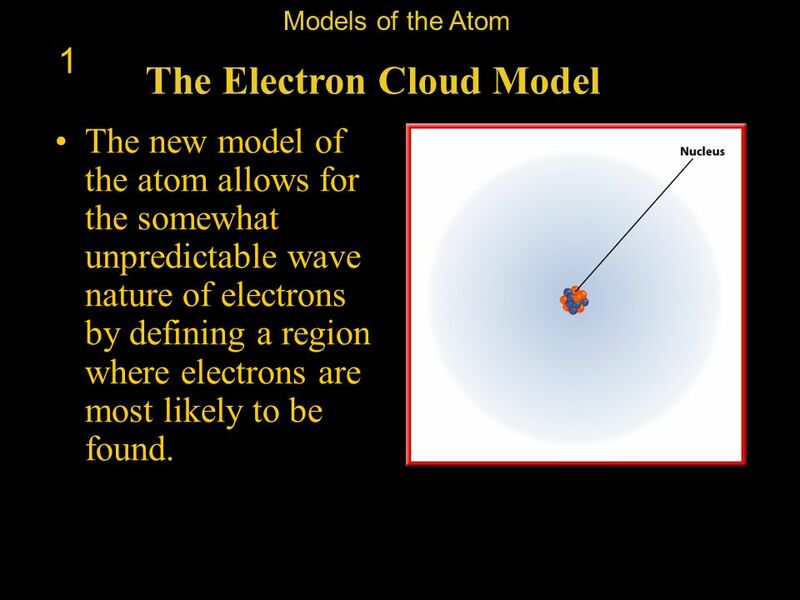 Models of the Atom 1 The Electron Cloud Model The new model of the atom allows for the somewhat unpredictable wave nature of electrons by defining a region where electrons are most likely to be found. 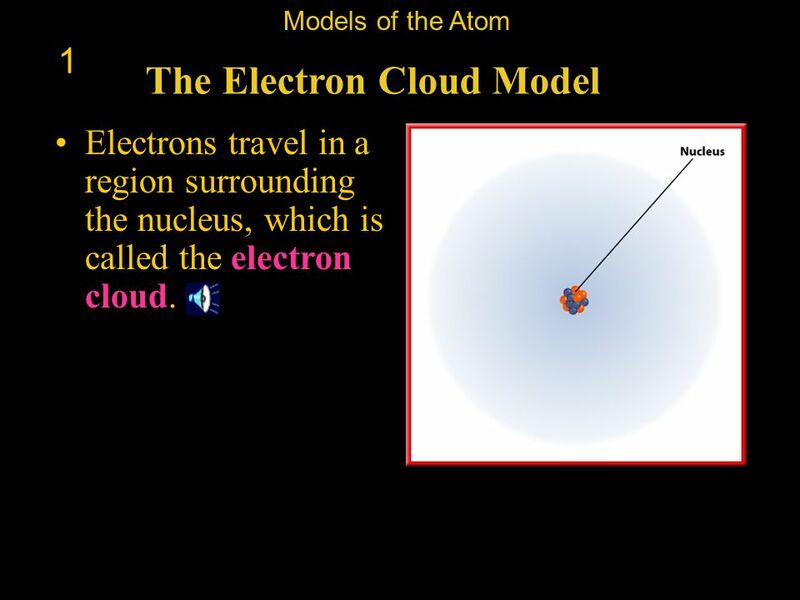 Models of the Atom 1 The Electron Cloud Model Electrons travel in a region surrounding the nucleus, which is called the electron cloud. Models of the Atom 1 The Electron Cloud Model The electrons are more likely to be close to the nucleus rather than farther away because they are attracted to the positive charges of the proton. 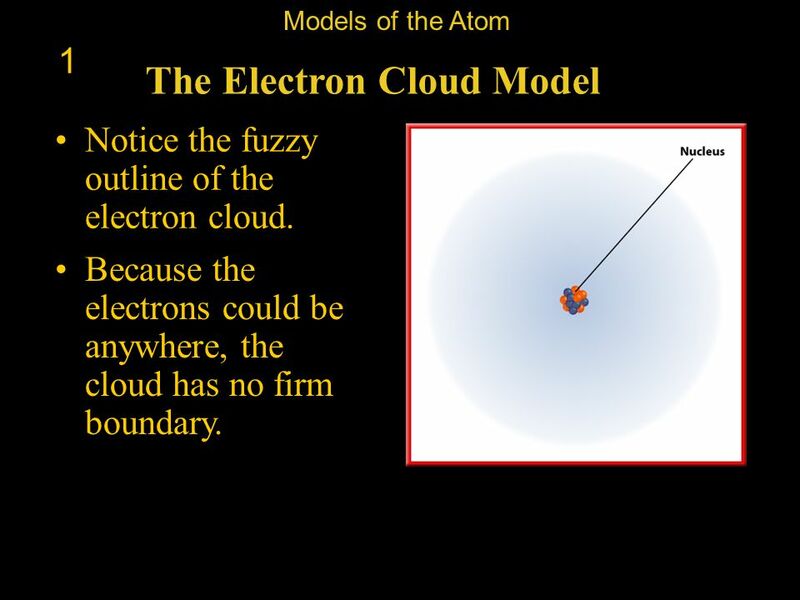 Models of the Atom 1 The Electron Cloud Model Notice the fuzzy outline of the electron cloud. Because the electrons could be anywhere, the cloud has no firm boundary. 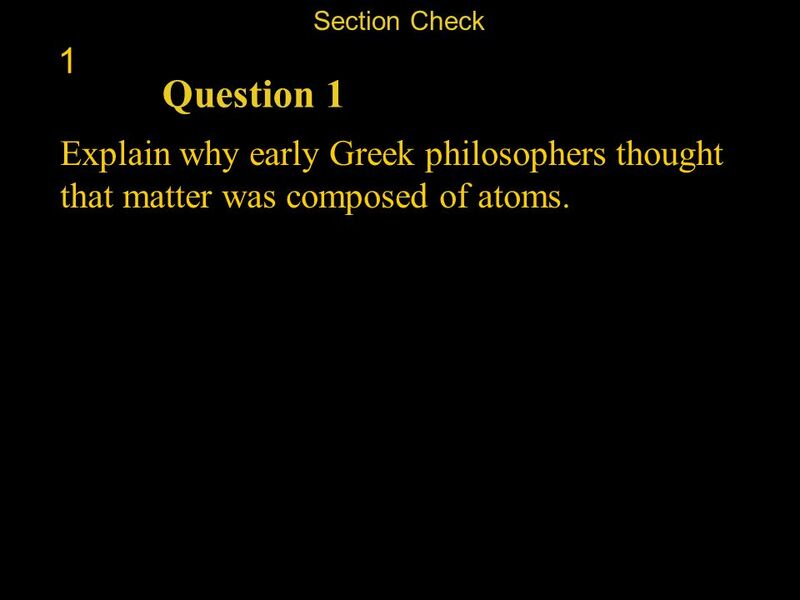 46 Section Check 1 Question 1 Explain why early Greek philosophers thought that matter was composed of atoms. 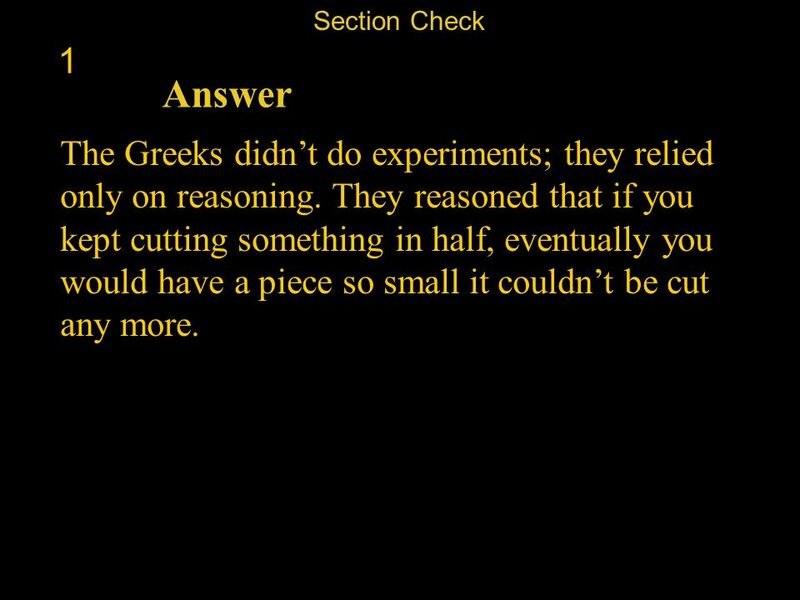 47 Section Check 1 Answer The Greeks didn’t do experiments; they relied only on reasoning. They reasoned that if you kept cutting something in half, eventually you would have a piece so small it couldn’t be cut any more. 48 Section Check 1 Question 2 The first modern atomic theory was proposed by ________. 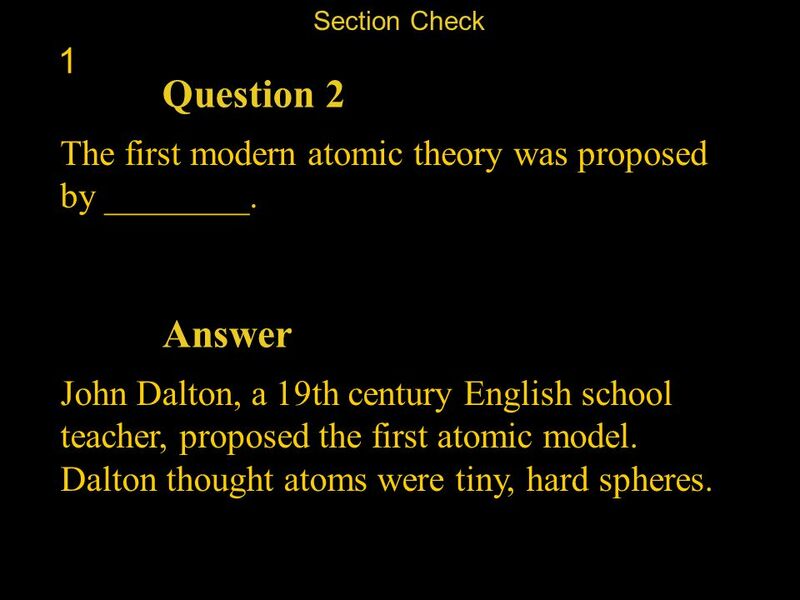 Answer John Dalton, a 19th century English school teacher, proposed the first atomic model. Dalton thought atoms were tiny, hard spheres. 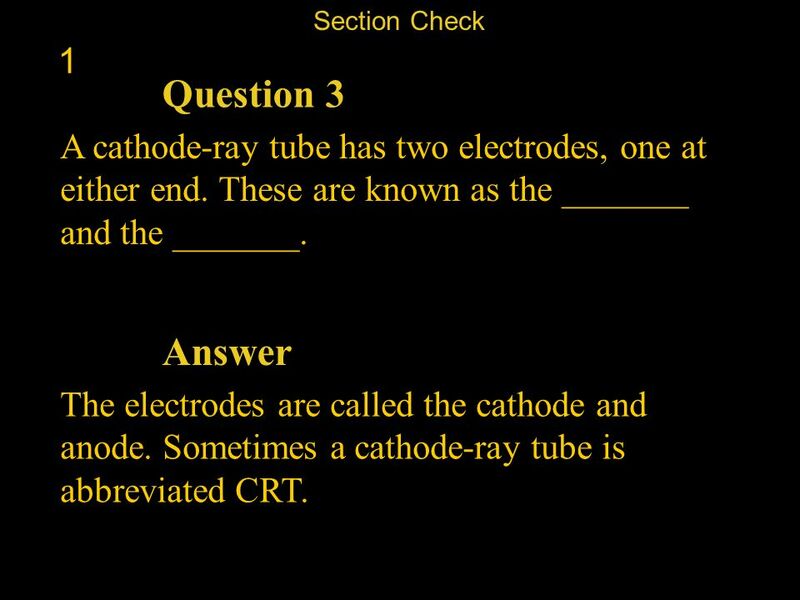 49 Section Check 1 Question 3 A cathode-ray tube has two electrodes, one at either end. These are known as the _______ and the _______. Answer The electrodes are called the cathode and anode. Sometimes a cathode-ray tube is abbreviated CRT. 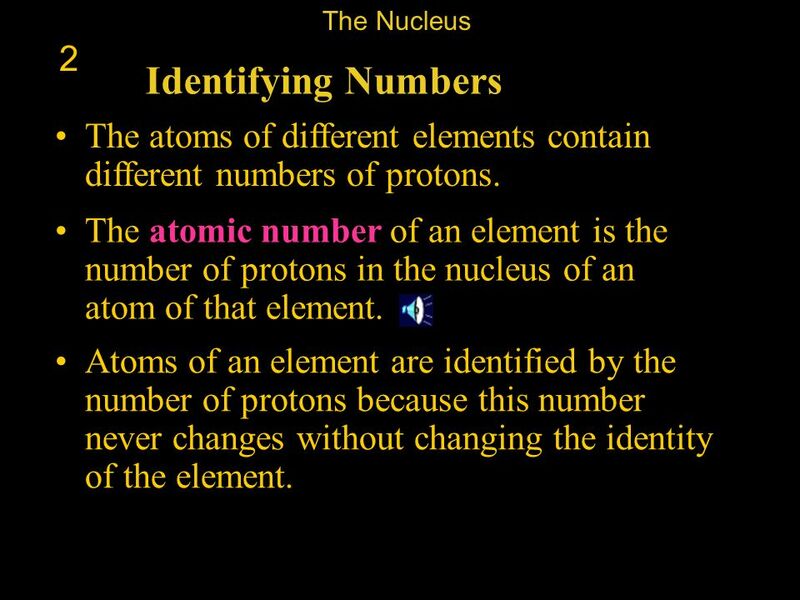 50 The Nucleus 2 Identifying Numbers The atoms of different elements contain different numbers of protons. The atomic number of an element is the number of protons in the nucleus of an atom of that element. Atoms of an element are identified by the number of protons because this number never changes without changing the identity of the element. 51 The Nucleus 2 Number of Neutrons A particular type of atom can have a varying number of neutrons in its nucleus. Most atoms of carbon have six neutrons. However, some carbon atoms have seven neutrons and some have eight. 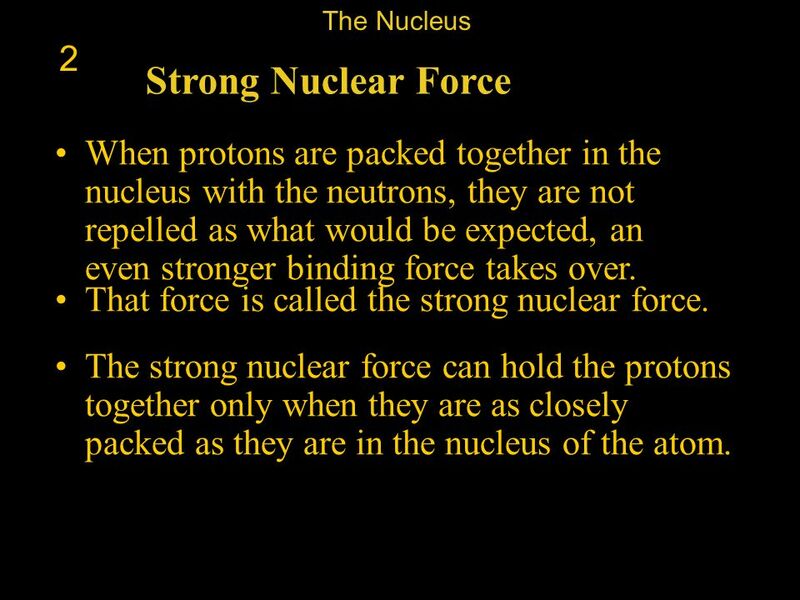 52 The Nucleus 2 Strong Nuclear Force When protons are packed together in the nucleus with the neutrons, they are not repelled as what would be expected, an even stronger binding force takes over. That force is called the strong nuclear force. The strong nuclear force can hold the protons together only when they are as closely packed as they are in the nucleus of the atom. 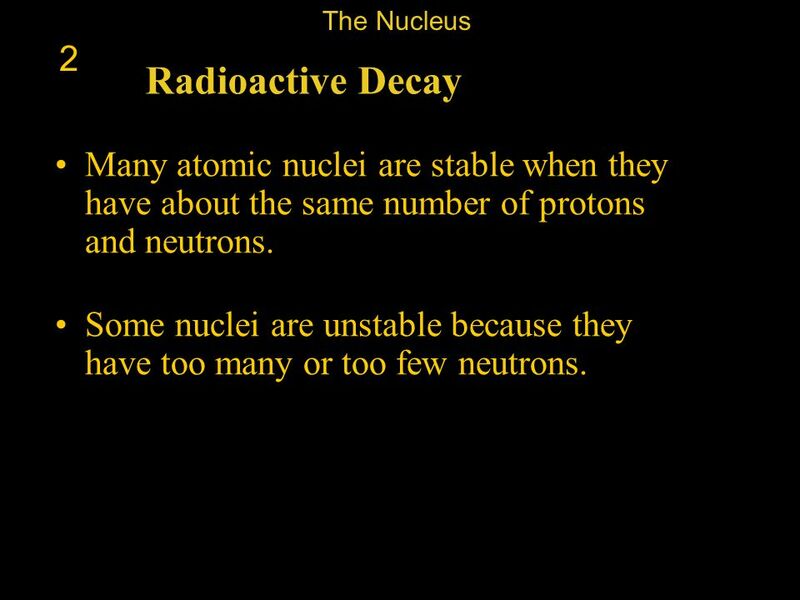 53 The Nucleus 2 Radioactive Decay Many atomic nuclei are stable when they have about the same number of protons and neutrons. Some nuclei are unstable because they have too many or too few neutrons. 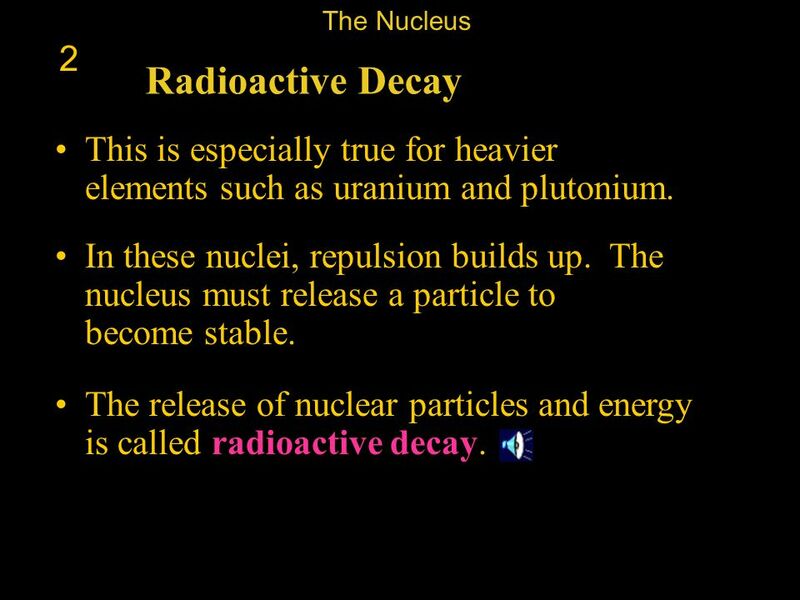 54 The Nucleus 2 Radioactive Decay This is especially true for heavier elements such as uranium and plutonium. In these nuclei, repulsion builds up. The nucleus must release a particle to become stable. The release of nuclear particles and energy is called radioactive decay. 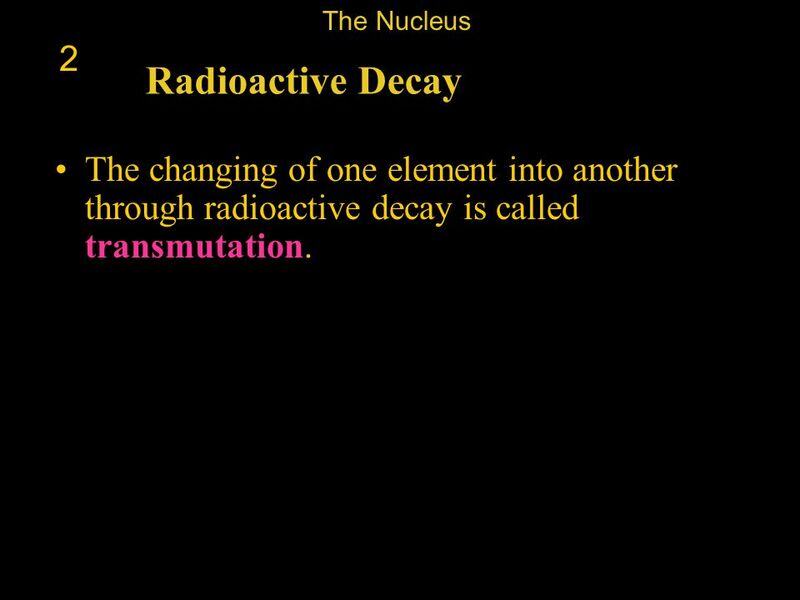 55 The Nucleus 2 Radioactive Decay The changing of one element into another through radioactive decay is called transmutation. 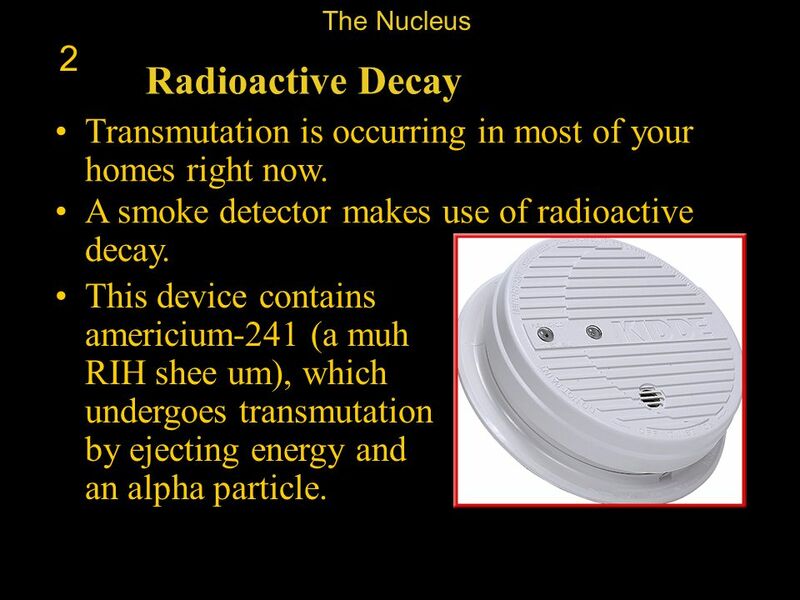 56 The Nucleus 2 Radioactive Decay Transmutation is occurring in most of your homes right now. A smoke detector makes use of radioactive decay. This device contains americium-241 (a muh RIH shee um), which undergoes transmutation by ejecting energy and an alpha particle. 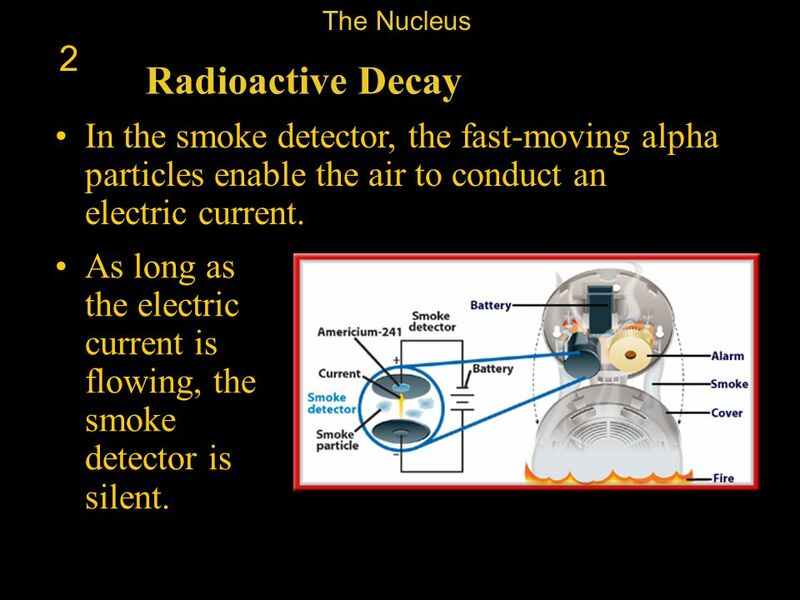 57 The Nucleus 2 Radioactive Decay In the smoke detector, the fast-moving alpha particles enable the air to conduct an electric current. As long as the electric current is flowing, the smoke detector is silent. 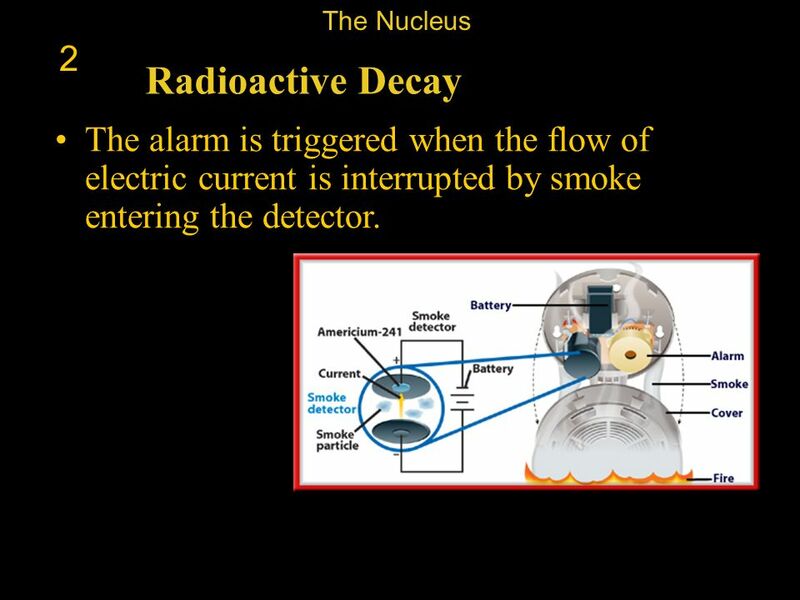 58 The Nucleus 2 Radioactive Decay The alarm is triggered when the flow of electric current is interrupted by smoke entering the detector. 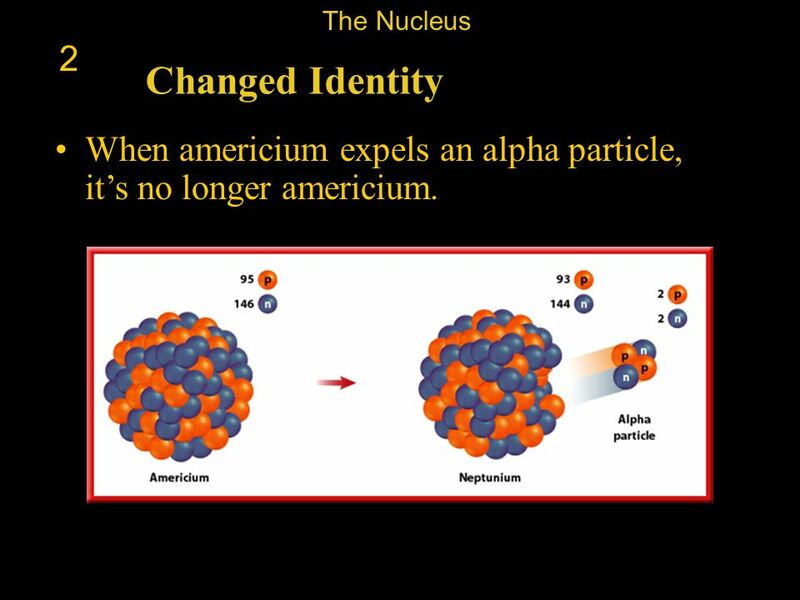 59 The Nucleus 2 Changed Identity When americium expels an alpha particle, it’s no longer americium. 60 The Nucleus 2 Changed Identity After the transmutation, it becomes the element that has 93 protons, neptunium. 61 The Nucleus 2 Changed Identity All the nuclear particles of americium still exist after the transmutation. 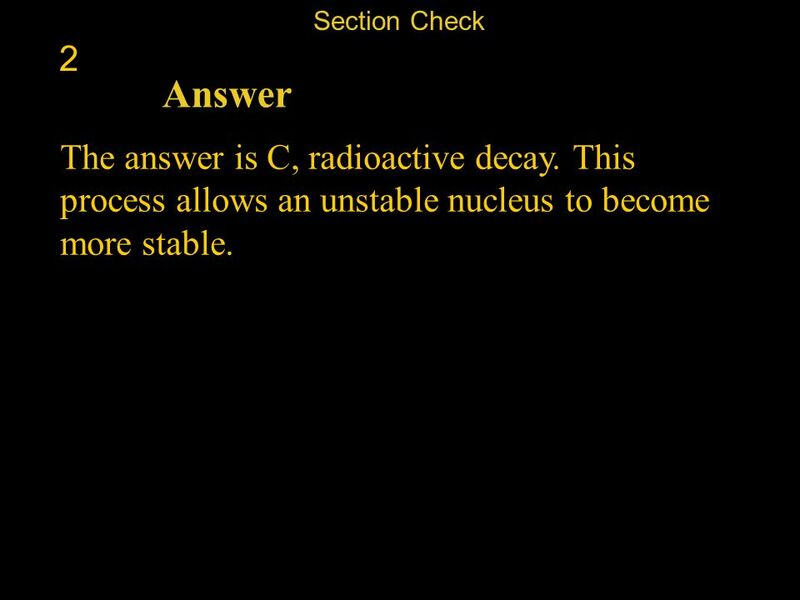 62 Rate of Decay 2 Radioactive decay is random. 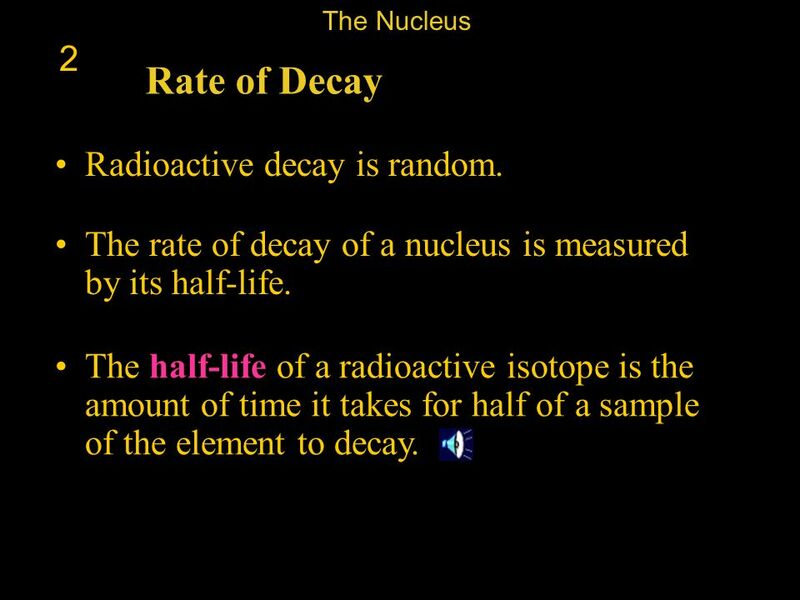 The Nucleus 2 Rate of Decay Radioactive decay is random. The rate of decay of a nucleus is measured by its half-life. The half-life of a radioactive isotope is the amount of time it takes for half of a sample of the element to decay. 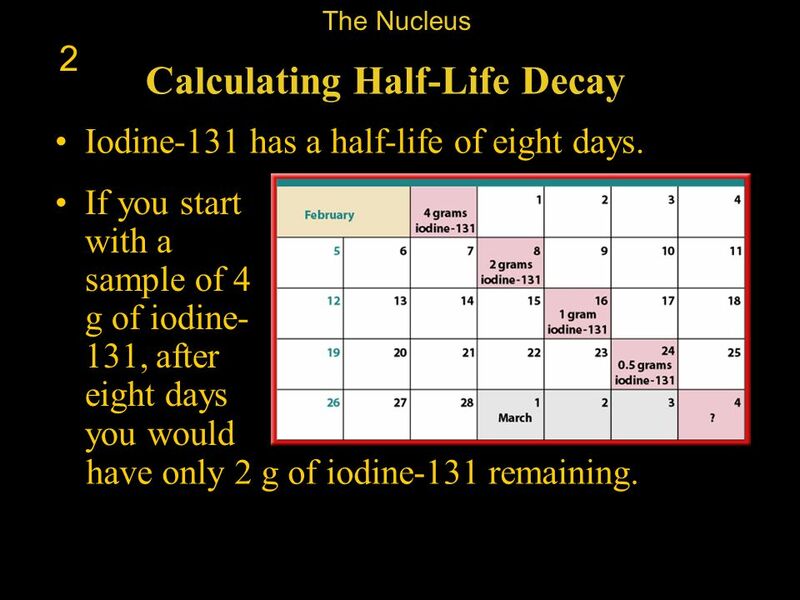 The Nucleus 2 Calculating Half-Life Decay Iodine-131 has a half-life of eight days. If you start with a sample of 4 g of iodine-131, after eight days you would have only 2 g of iodine-131 remaining. The Nucleus 2 Calculating Half-Life Decay After 16 days, or two half-lives, half of the 2 g would have decayed and you would have only 1 g left. 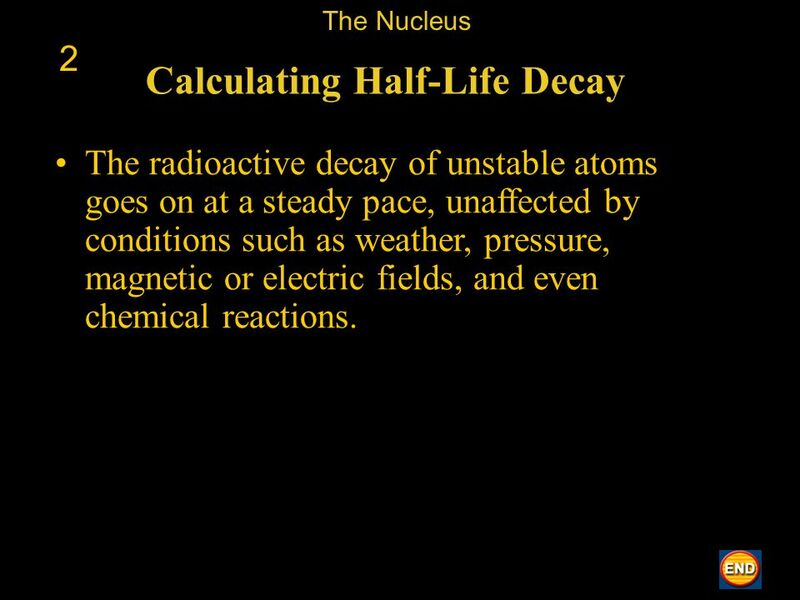 The Nucleus 2 Calculating Half-Life Decay The radioactive decay of unstable atoms goes on at a steady pace, unaffected by conditions such as weather, pressure, magnetic or electric fields, and even chemical reactions. 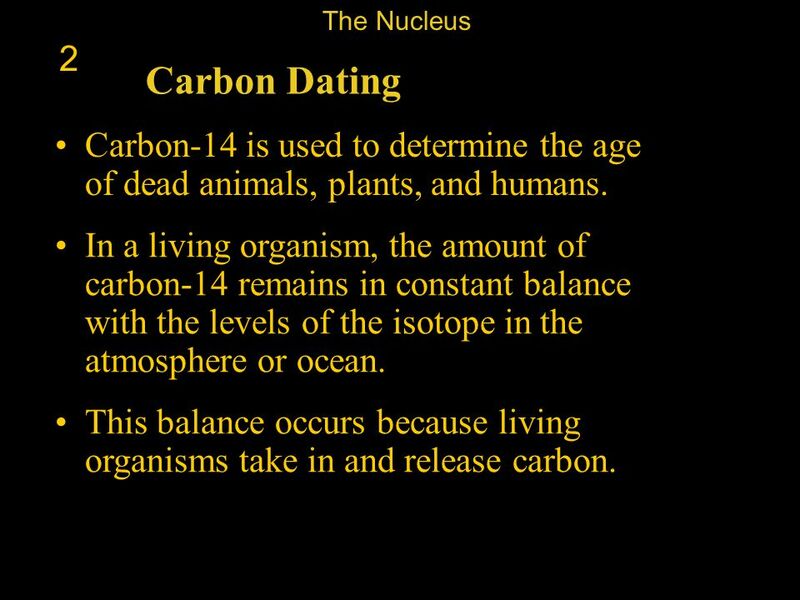 66 The Nucleus 2 Carbon Dating Carbon-14 is used to determine the age of dead animals, plants, and humans. In a living organism, the amount of carbon-14 remains in constant balance with the levels of the isotope in the atmosphere or ocean. This balance occurs because living organisms take in and release carbon. 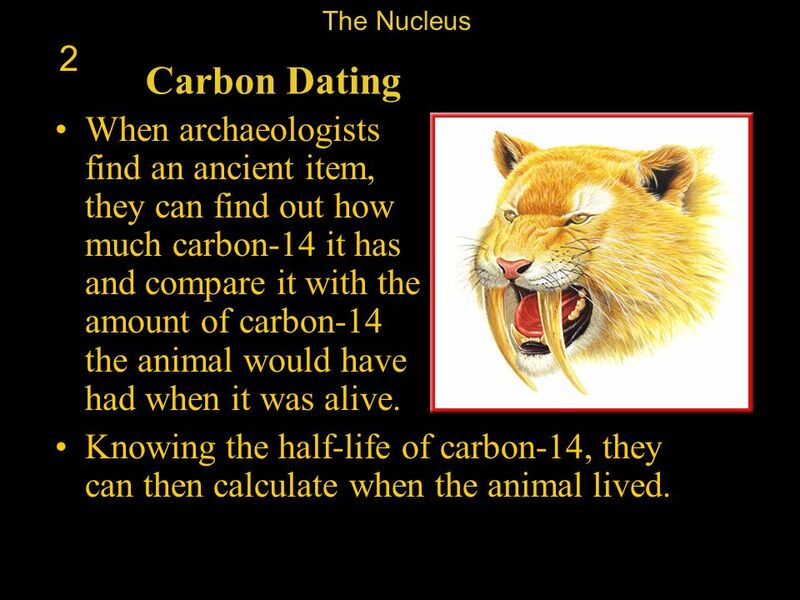 67 The Nucleus 2 Carbon Dating When archaeologists find an ancient item, they can find out how much carbon-14 it has and compare it with the amount of carbon-14 the animal would have had when it was alive. Knowing the half-life of carbon-14, they can then calculate when the animal lived. 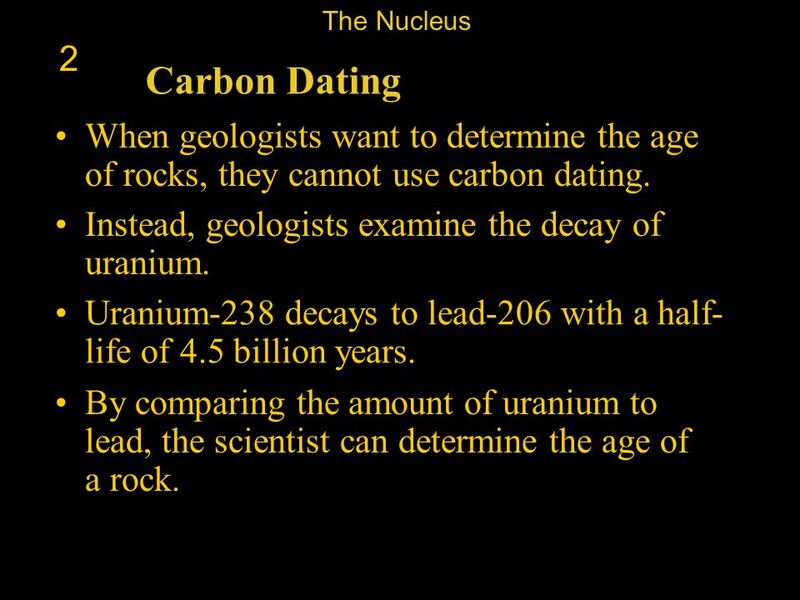 68 The Nucleus 2 Carbon Dating When geologists want to determine the age of rocks, they cannot use carbon dating. Instead, geologists examine the decay of uranium. Uranium-238 decays to lead-206 with a half-life of 4.5 billion years. By comparing the amount of uranium to lead, the scientist can determine the age of a rock. 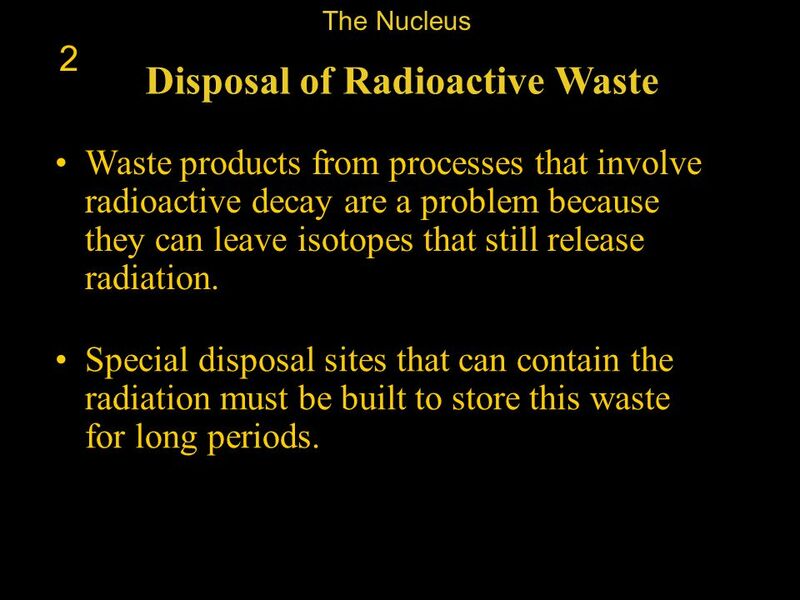 The Nucleus 2 Disposal of Radioactive Waste Waste products from processes that involve radioactive decay are a problem because they can leave isotopes that still release radiation. Special disposal sites that can contain the radiation must be built to store this waste for long periods. 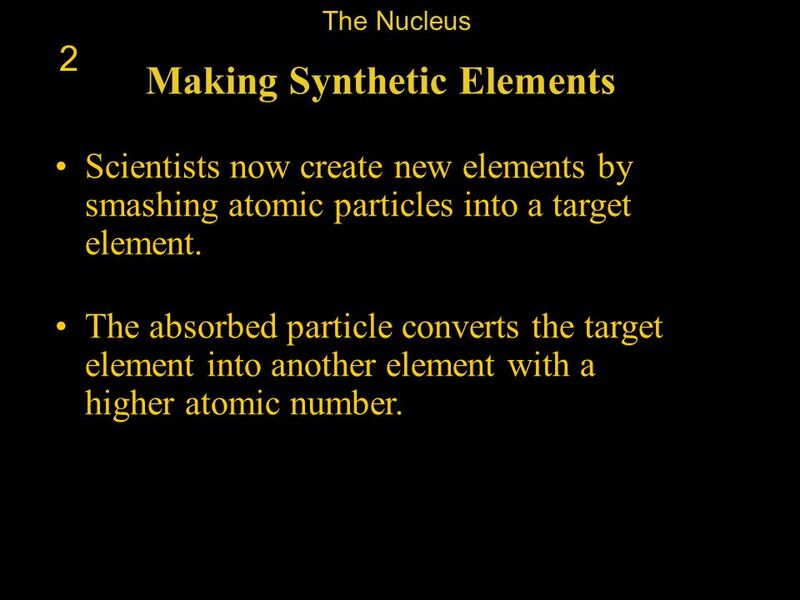 The Nucleus 2 Making Synthetic Elements Scientists now create new elements by smashing atomic particles into a target element. The absorbed particle converts the target element into another element with a higher atomic number. 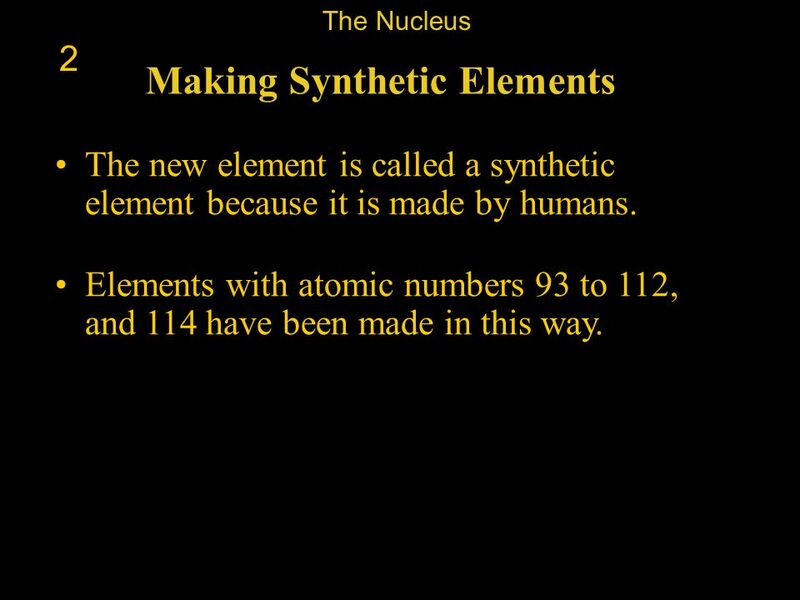 The Nucleus 2 Making Synthetic Elements The new element is called a synthetic element because it is made by humans. Elements with atomic numbers 93 to 112, and 114 have been made in this way. 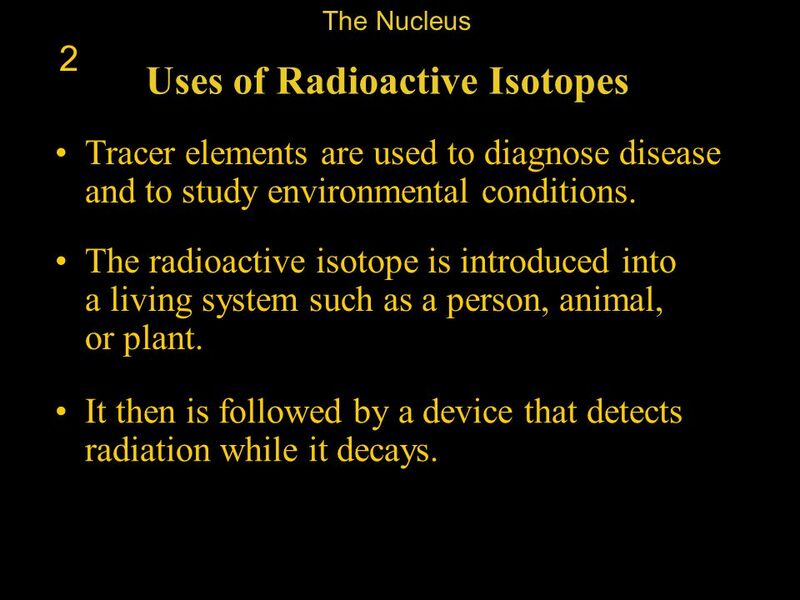 The Nucleus 2 Uses of Radioactive Isotopes Tracer elements are used to diagnose disease and to study environmental conditions. The radioactive isotope is introduced into a living system such as a person, animal, or plant. It then is followed by a device that detects radiation while it decays. The Nucleus 2 Uses of Radioactive Isotopes These devices often present the results as a display on a screen or as a photograph. 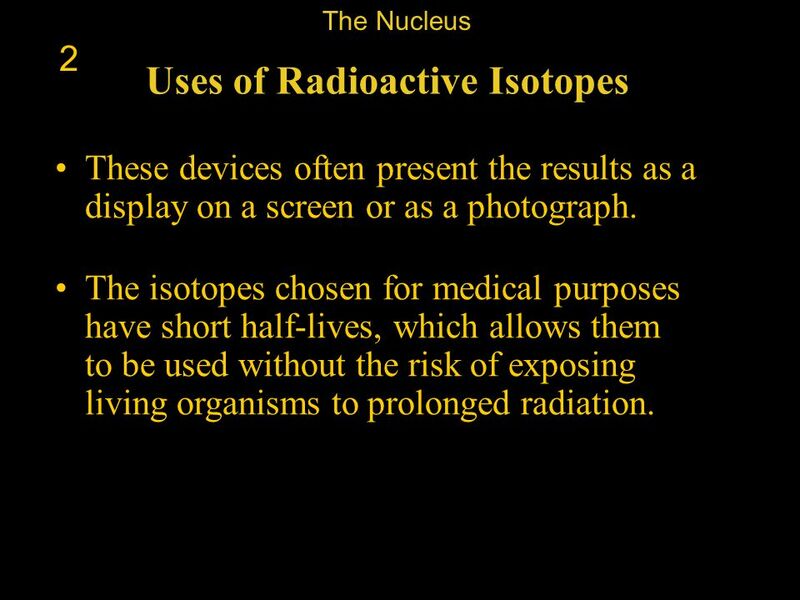 The isotopes chosen for medical purposes have short half-lives, which allows them to be used without the risk of exposing living organisms to prolonged radiation. 74 Question 1 2 How can carbon-12 and carbon-14 both be carbon atoms? 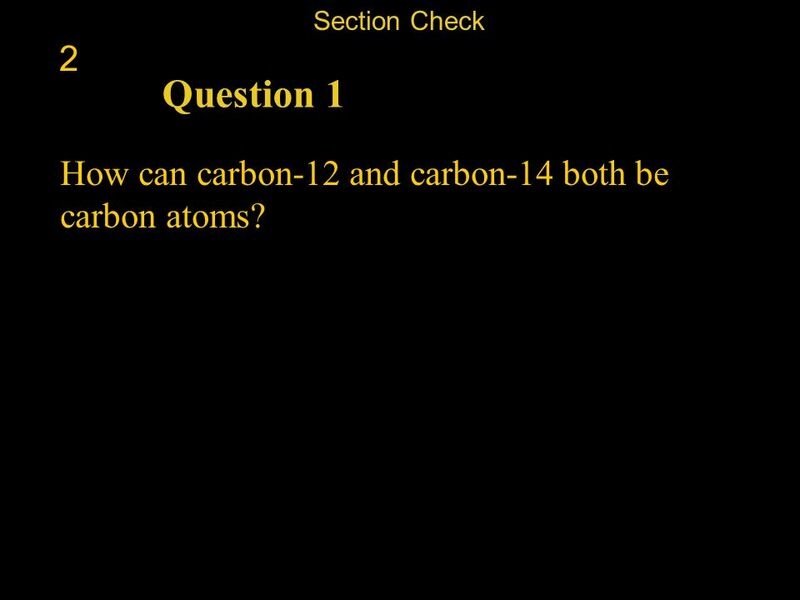 Section Check 2 Question 1 How can carbon-12 and carbon-14 both be carbon atoms? 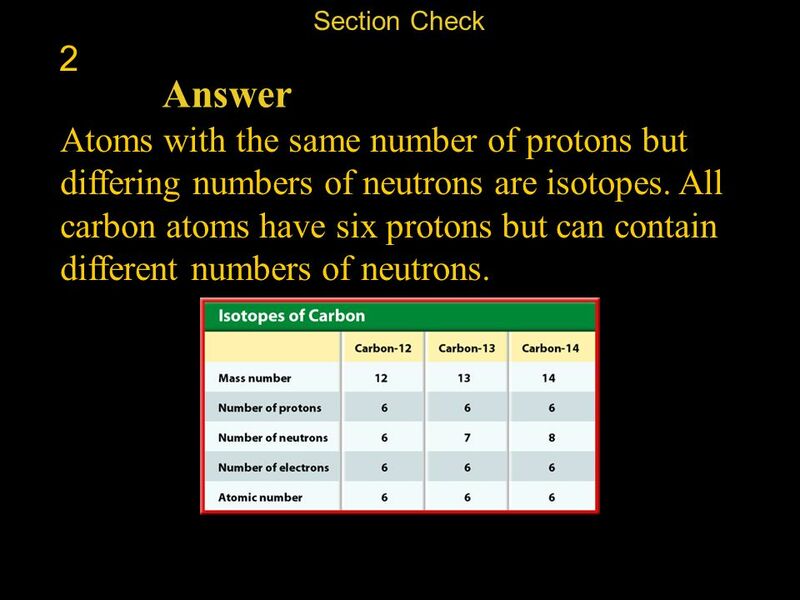 75 Section Check 2 Answer Atoms with the same number of protons but differing numbers of neutrons are isotopes. 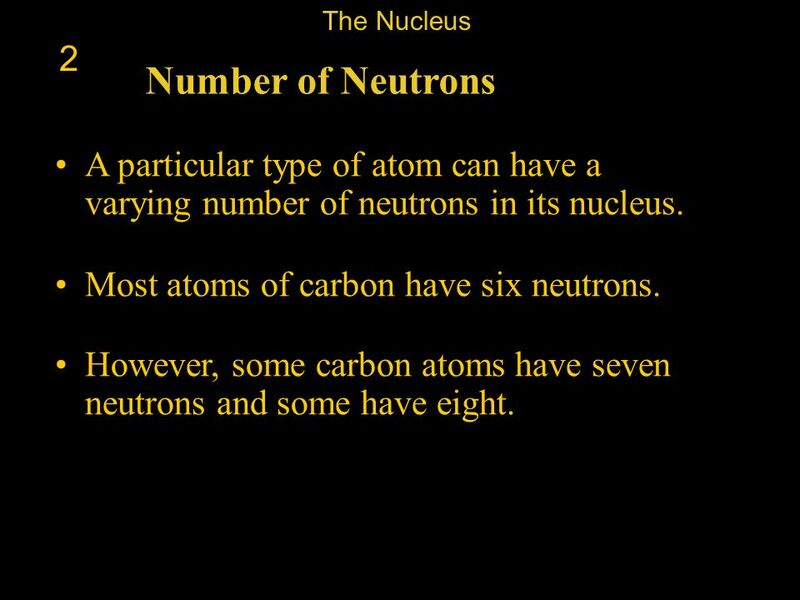 All carbon atoms have six protons but can contain different numbers of neutrons. 76 Question 2 Answer 2 What is the atomic number of an element? 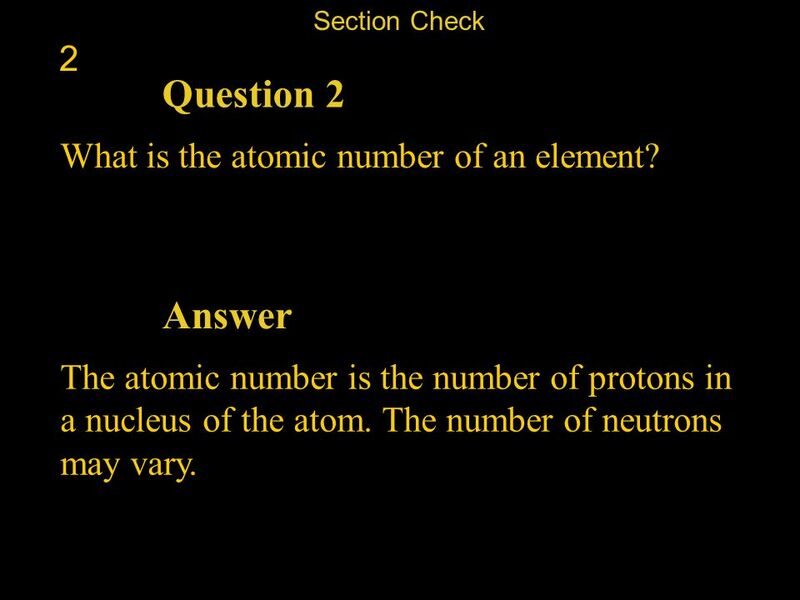 Section Check 2 Question 2 What is the atomic number of an element? Answer The atomic number is the number of protons in a nucleus of the atom. The number of neutrons may vary. 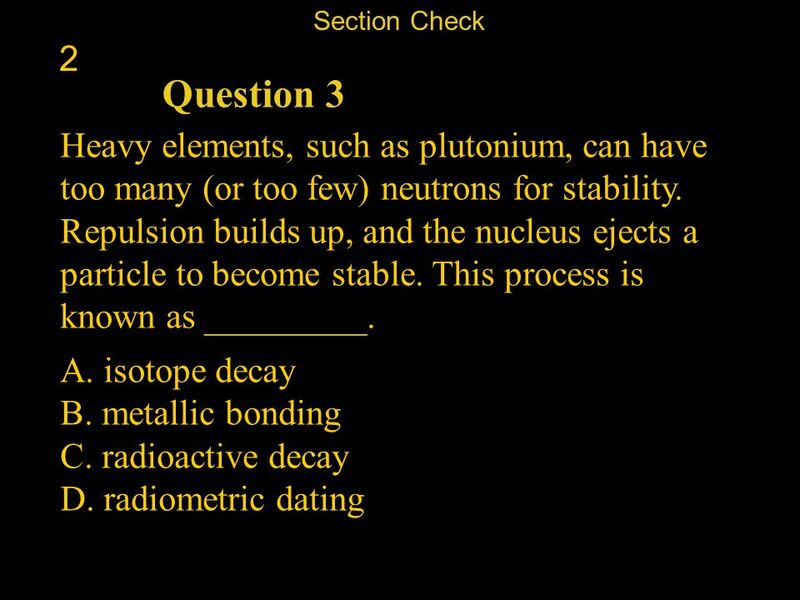 78 Section Check 2 Answer The answer is C, radioactive decay. This process allows an unstable nucleus to become more stable. 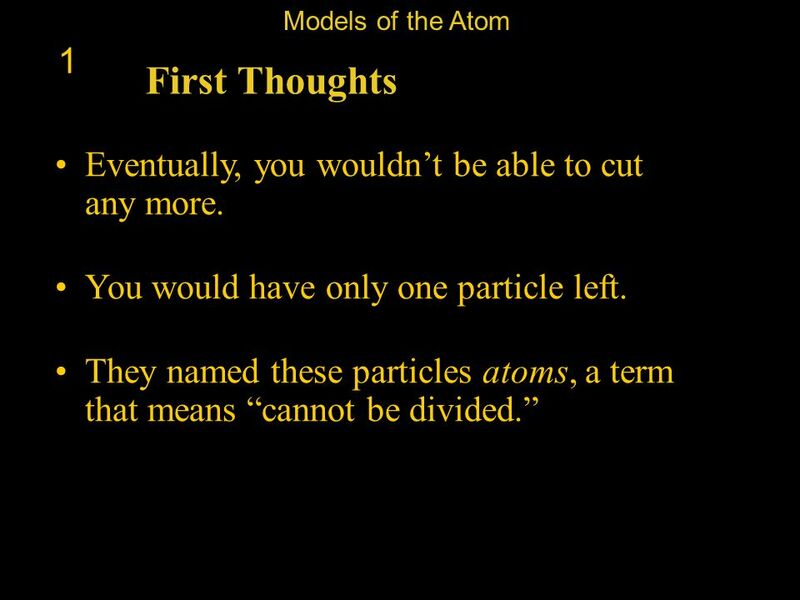 Download ppt "Chapter 14 : Inside the Atom"
WARM-UP Studying atoms is difficult because they are too small to see or directly observe even with the best scientific tools. Write a similar example. 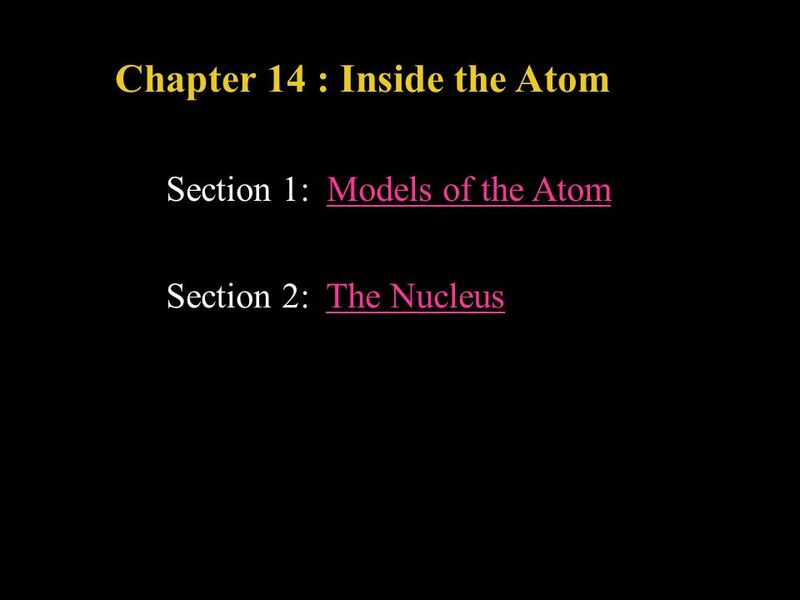 Chapter 12 Introduction to Atoms. Atomic Theory “History of. . . ”. Atomic Structure History of Atomic Theory. 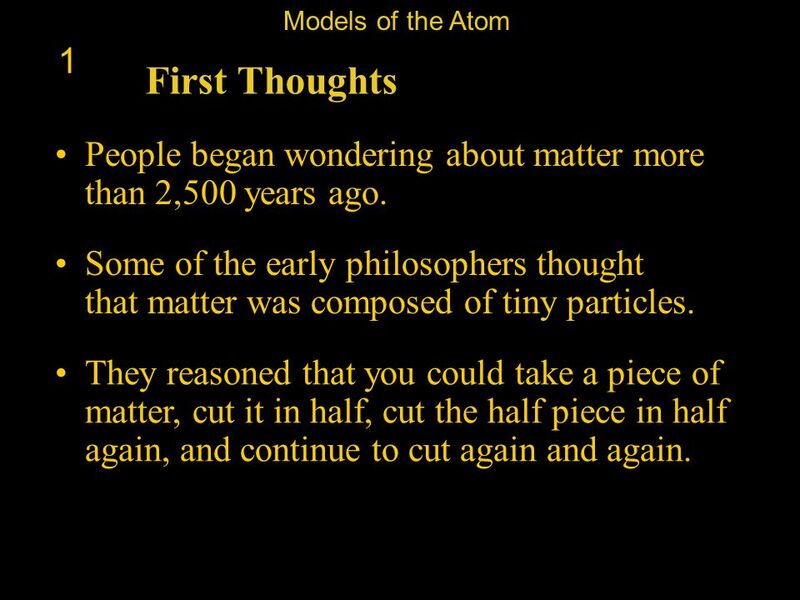 Democritus ( BC) Was the first person to come up with the idea of atom Believed that all matter was.